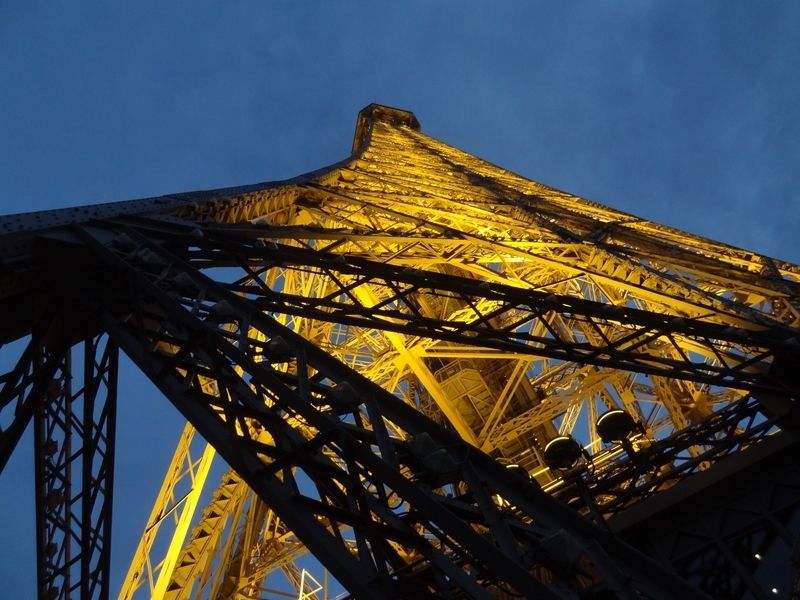 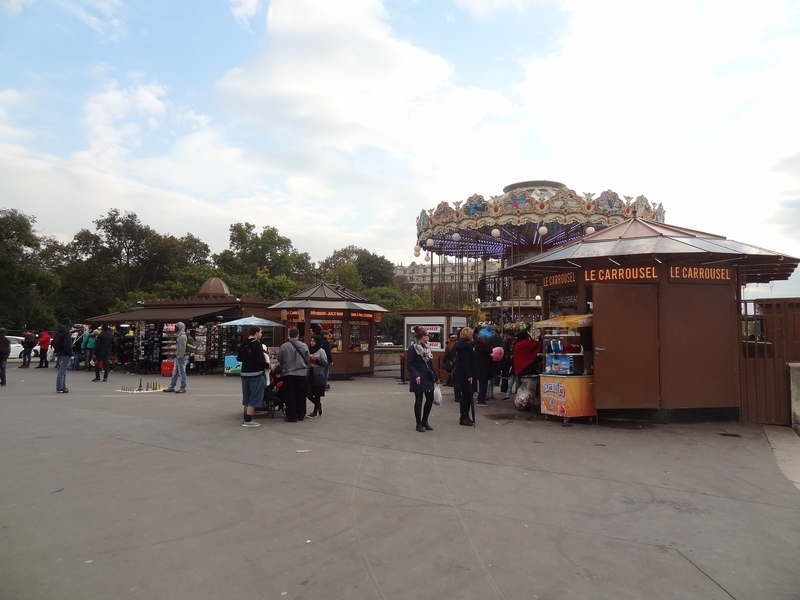 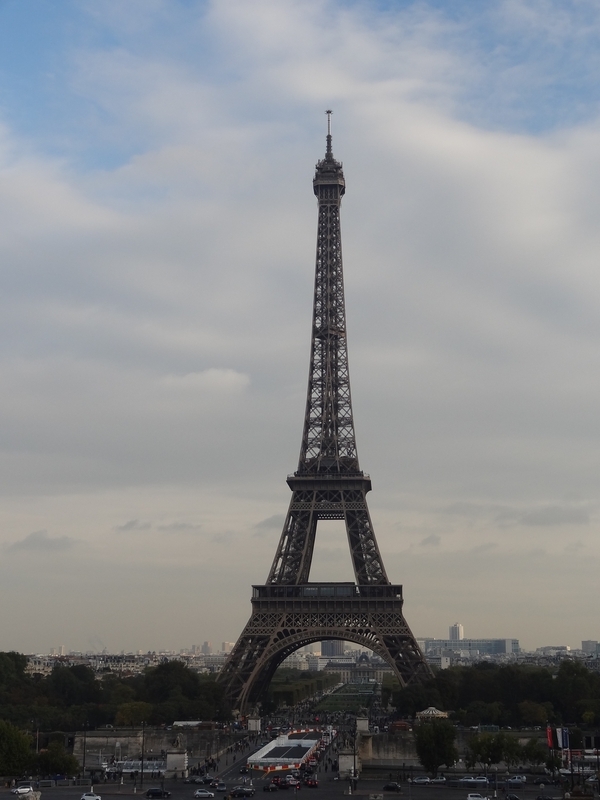 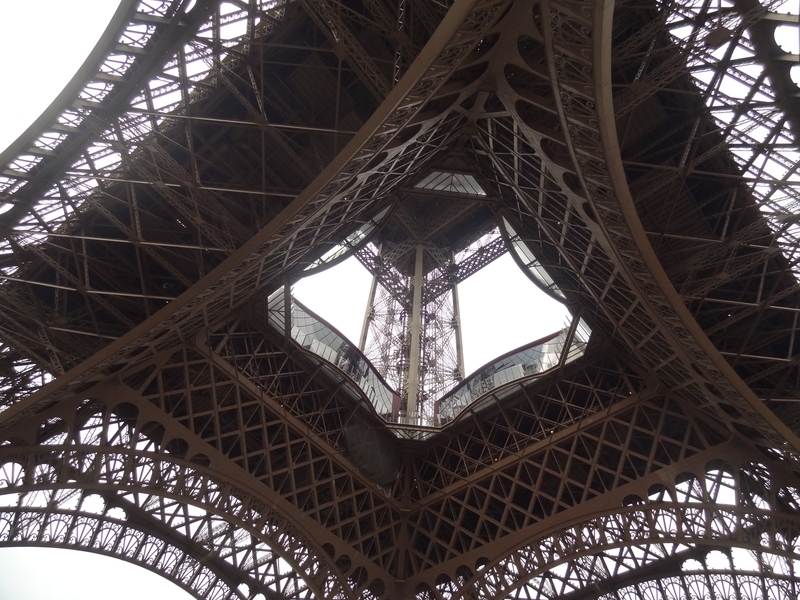 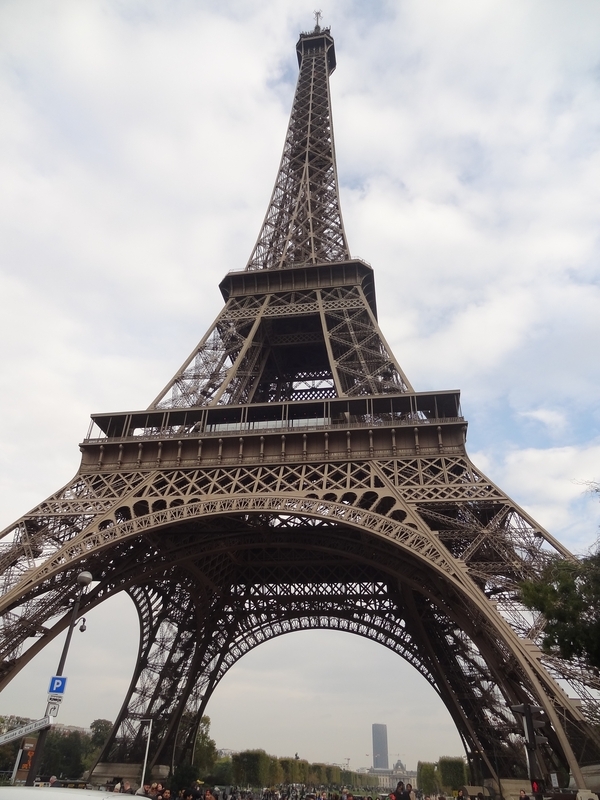 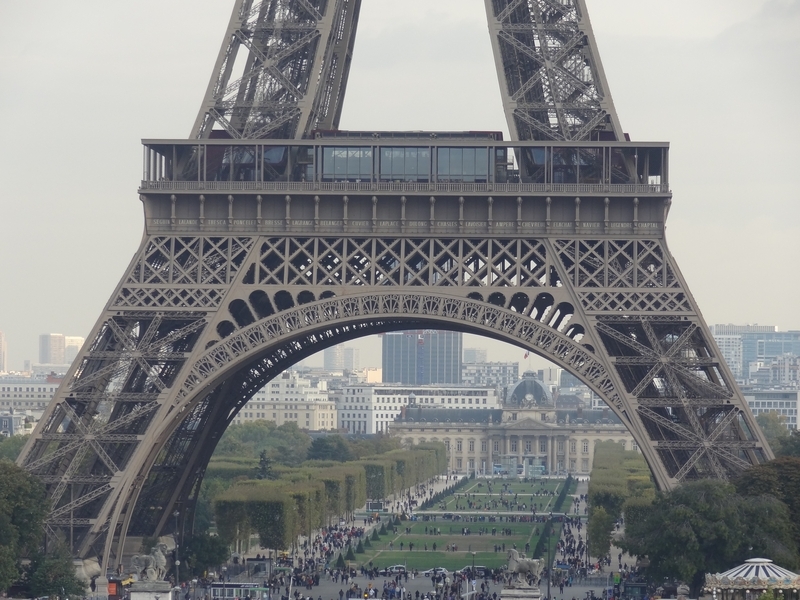 In parallel with the story of a visit to the Eiffel Tower, this site presents the same visit, but told through more than 150 photos taken at this time. 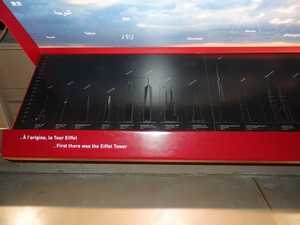 So it's the same thing, more explicit, but less precise. 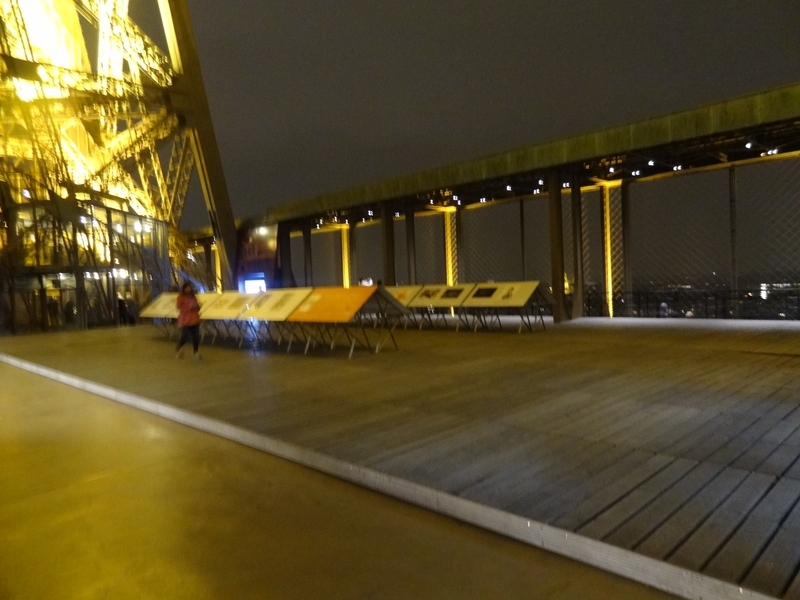 You can go from one story to another by using the links put everywhere, over the water. 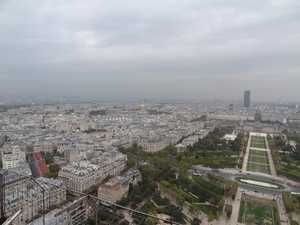 It's late afternoon that I planned to visit the Eiffel Tower. 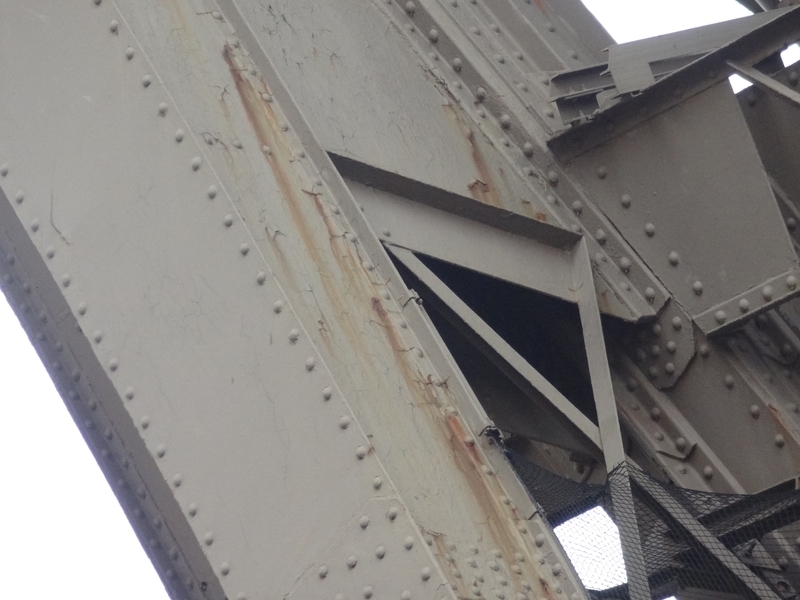 No by choice, by obligation. 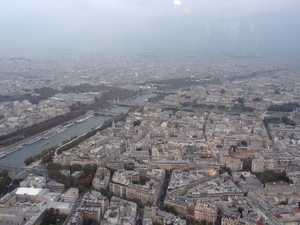 That day the weather is uncertain, and it will clearly deteriorate during the evening, but that I do not know yet ... I arrive by subway station Kleber. 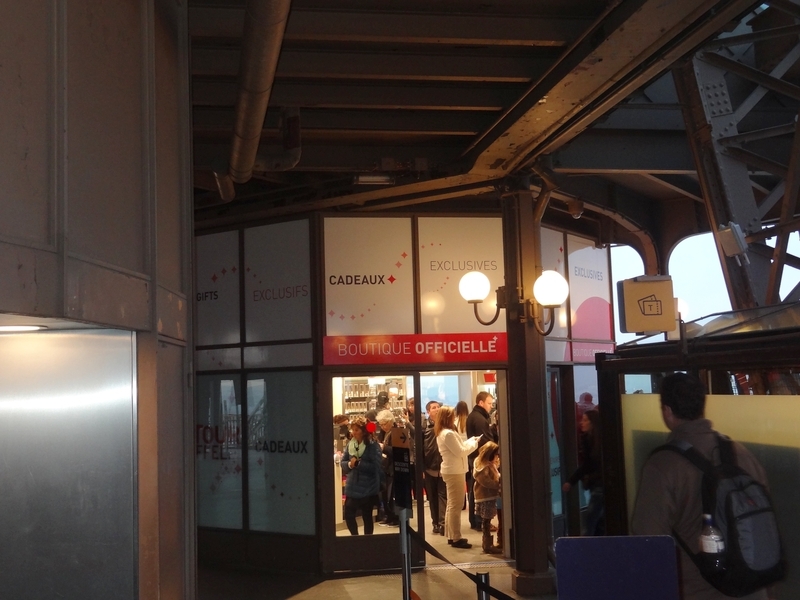 Subway exit on the wrong side, another 10 minutes lost to cross the square, then the trocadero. 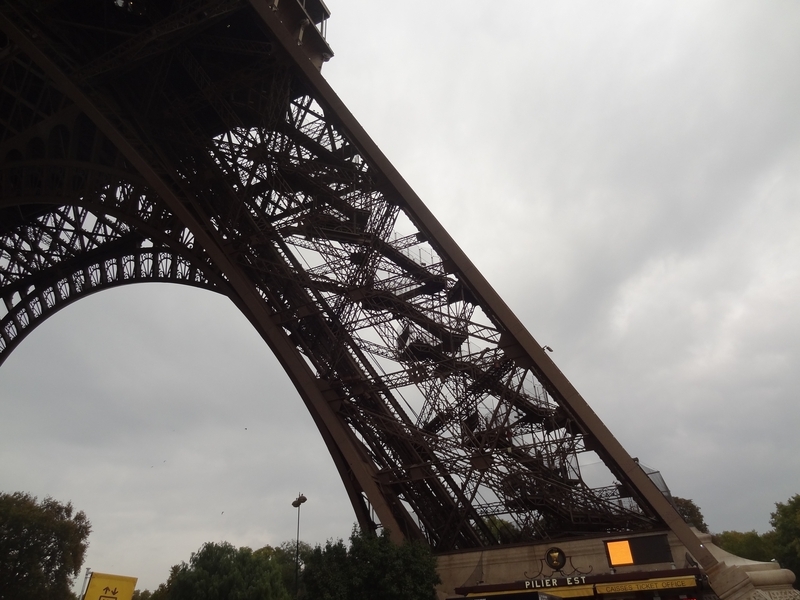 Finally, here it is, beautiful, in front of me. At its feet visitors swarm like ants. I will join them, time to go down. 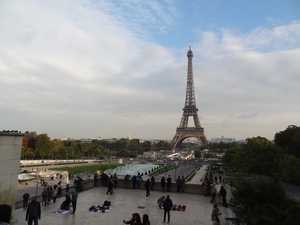 The gardens of Trocadero with the Eiffel Tower in the background. On a clear day, the monument is magnificent. It's a little stroll, to go on the spot. 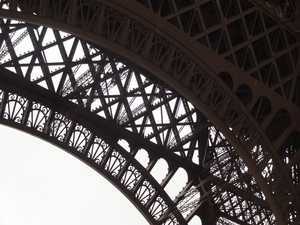 The Eiffel Tower close up, late afternoon. 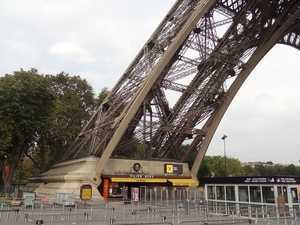 The West pillar is a shop, you can not buy tickets, which are on sale in a kiosk, next door. 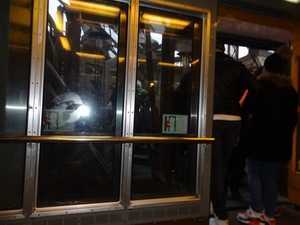 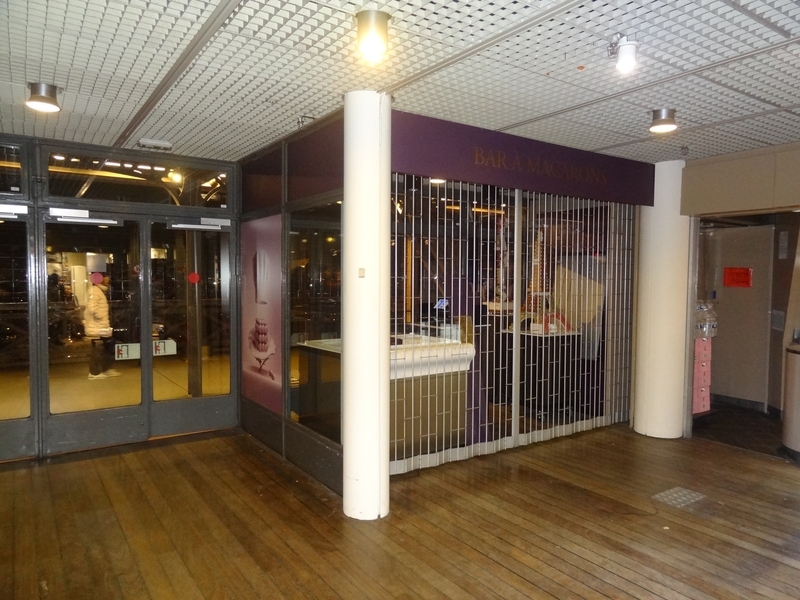 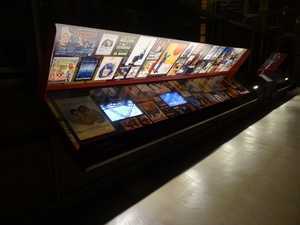 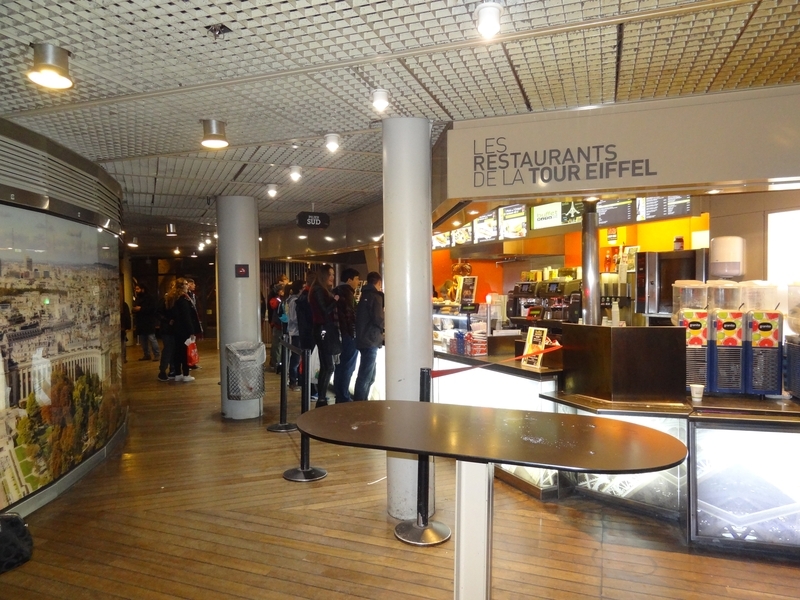 The North Pillar does not allow the purchase of tickets, in fact the purchase is done in kiosks, just next door. 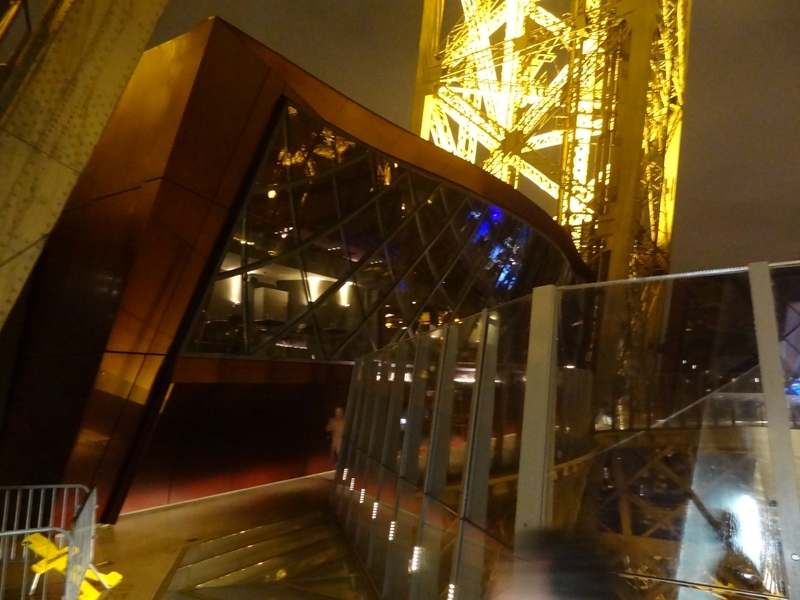 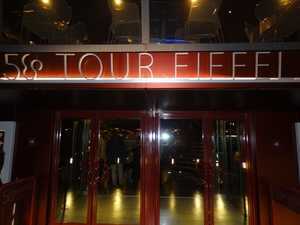 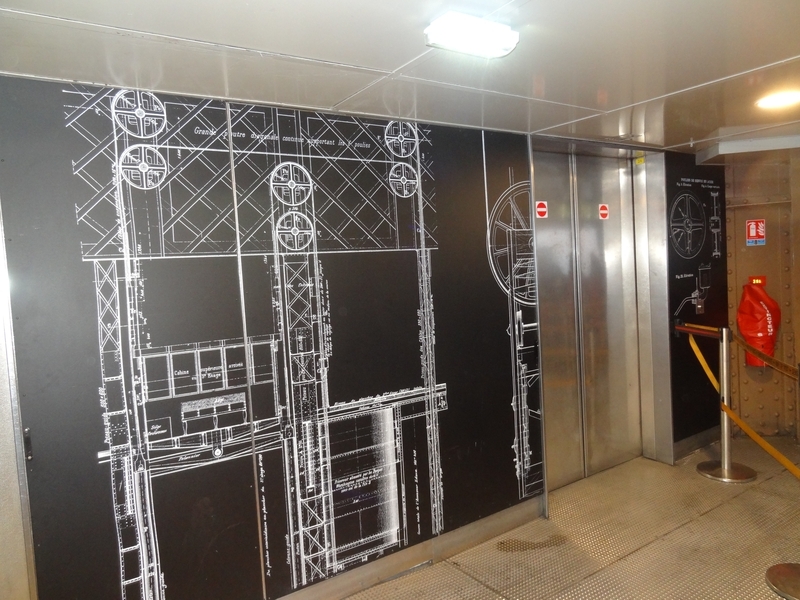 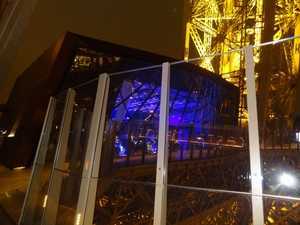 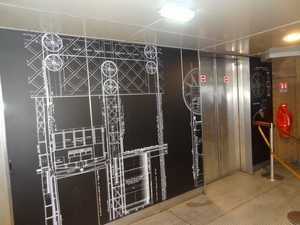 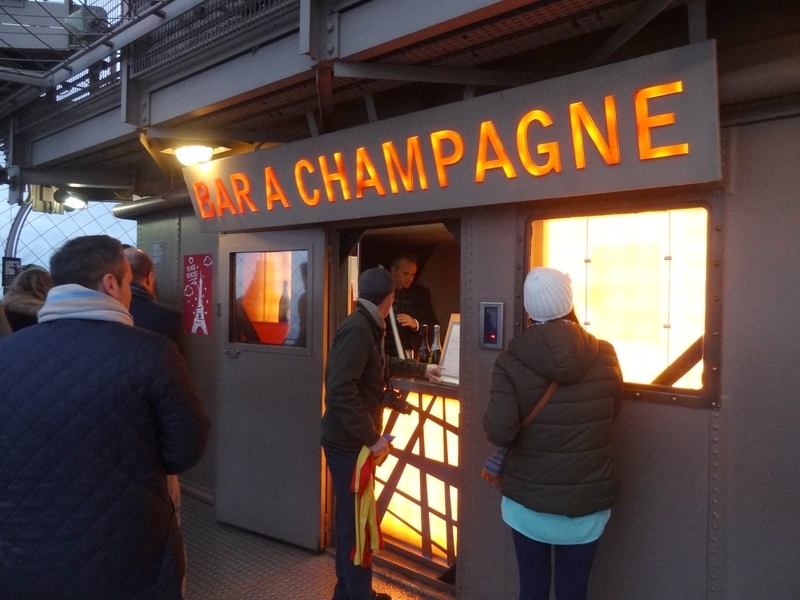 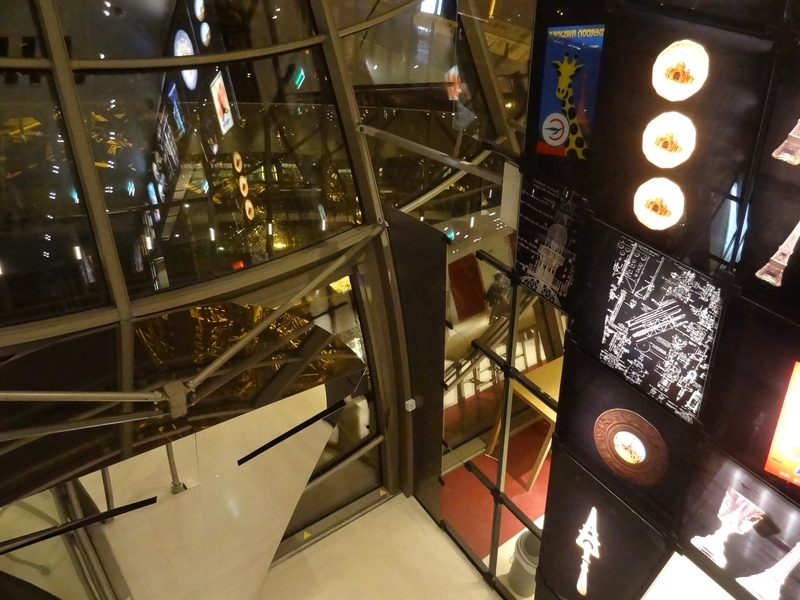 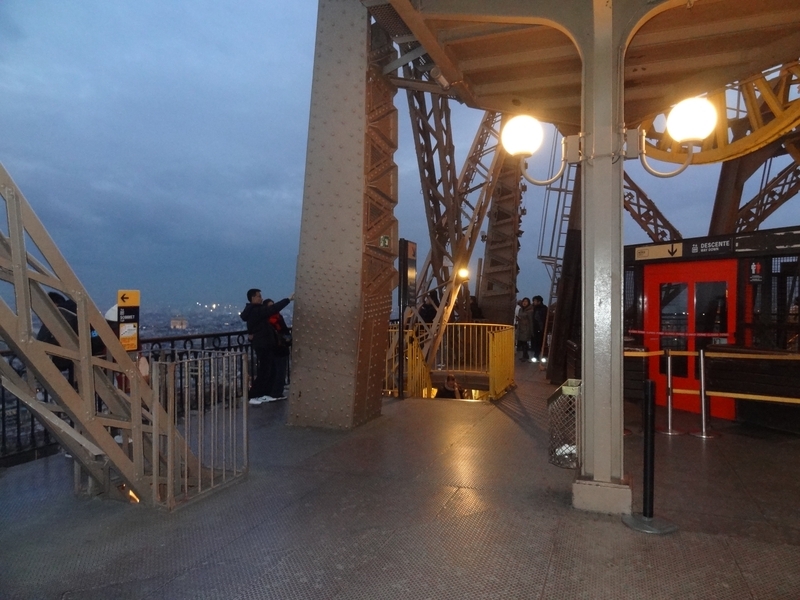 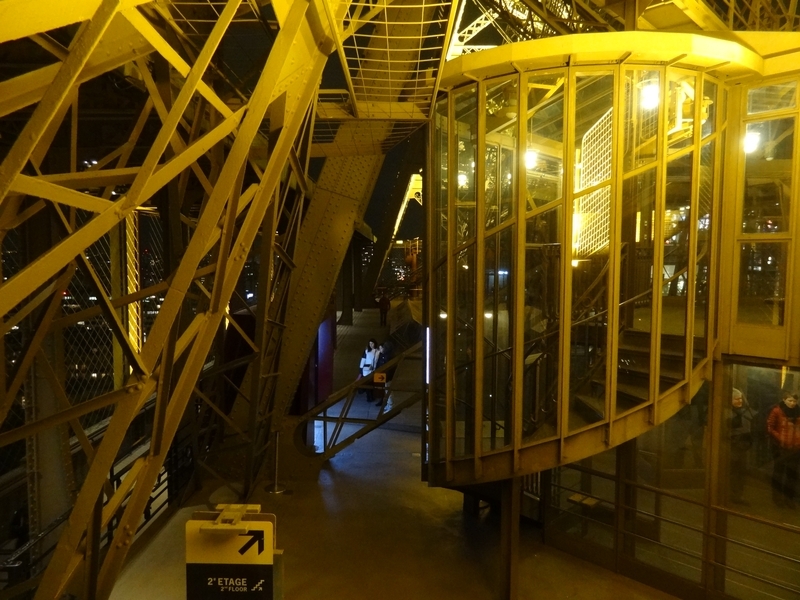 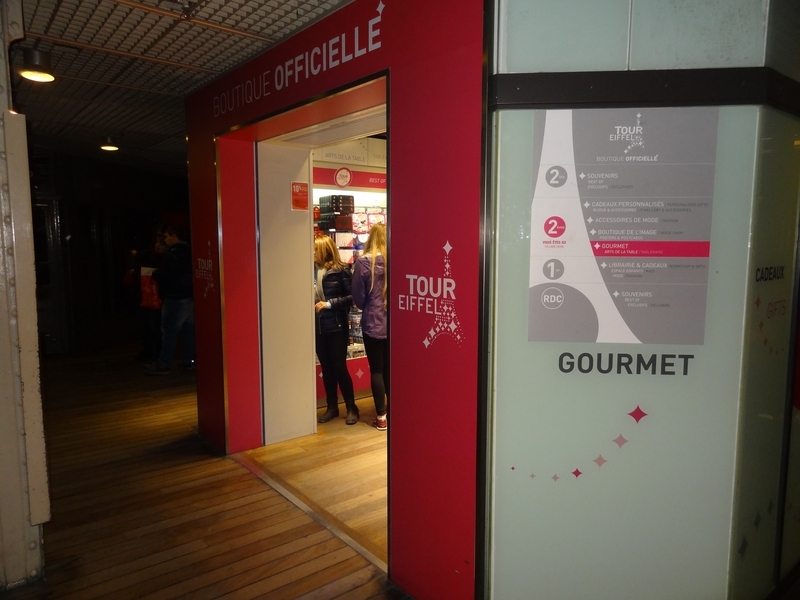 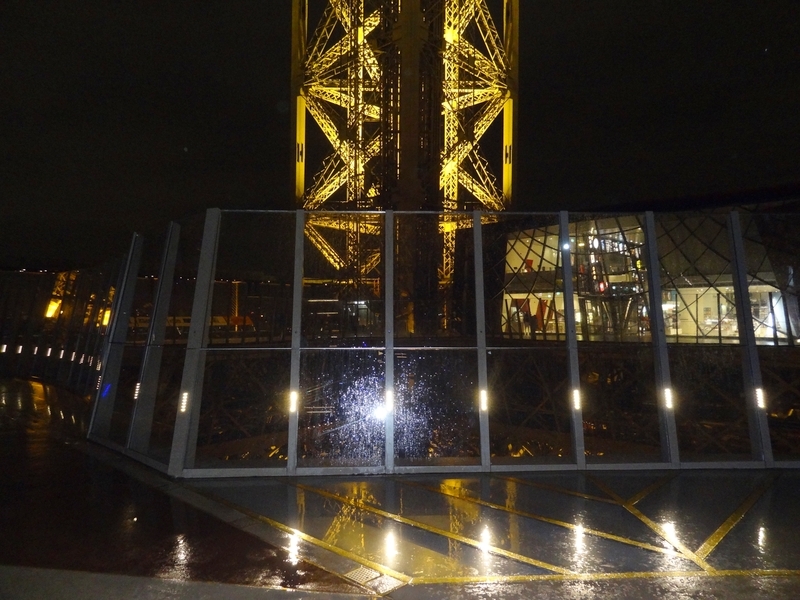 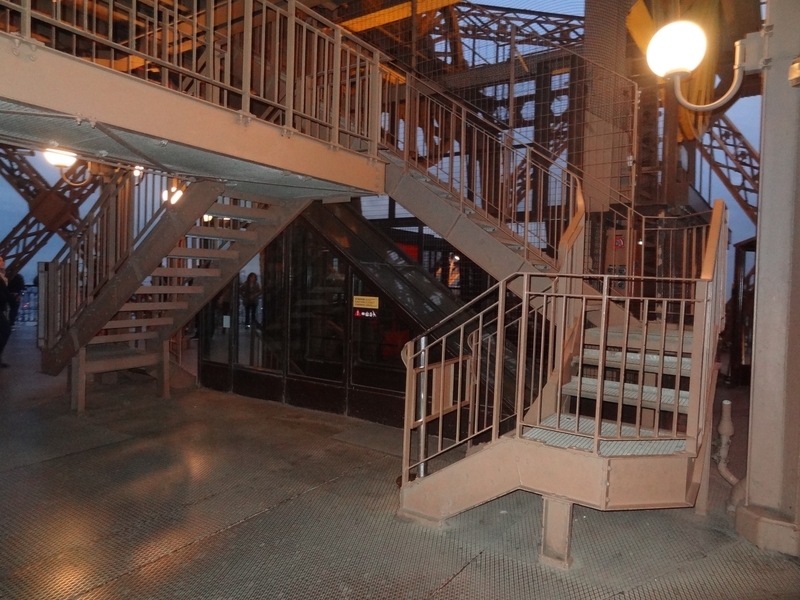 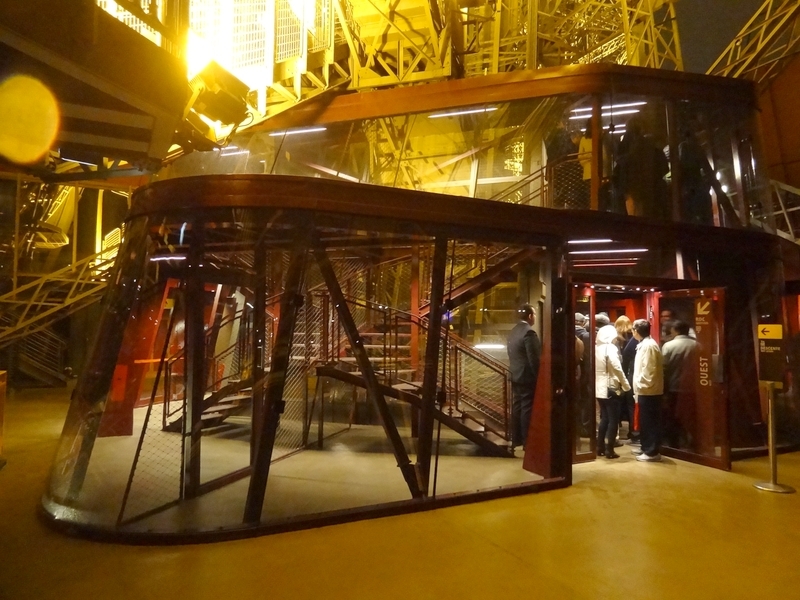 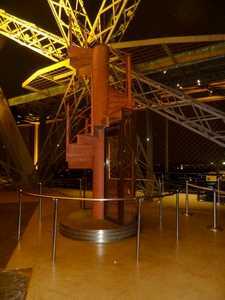 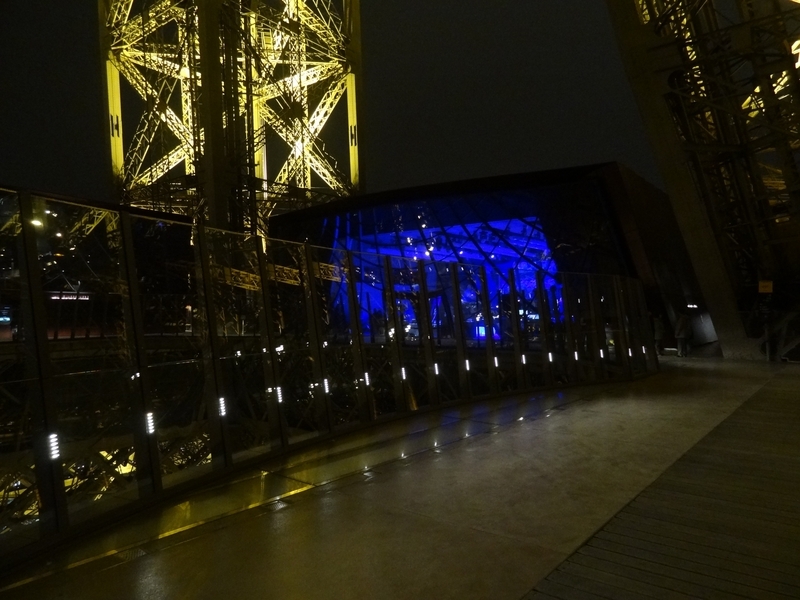 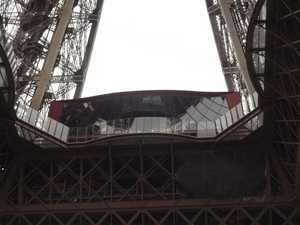 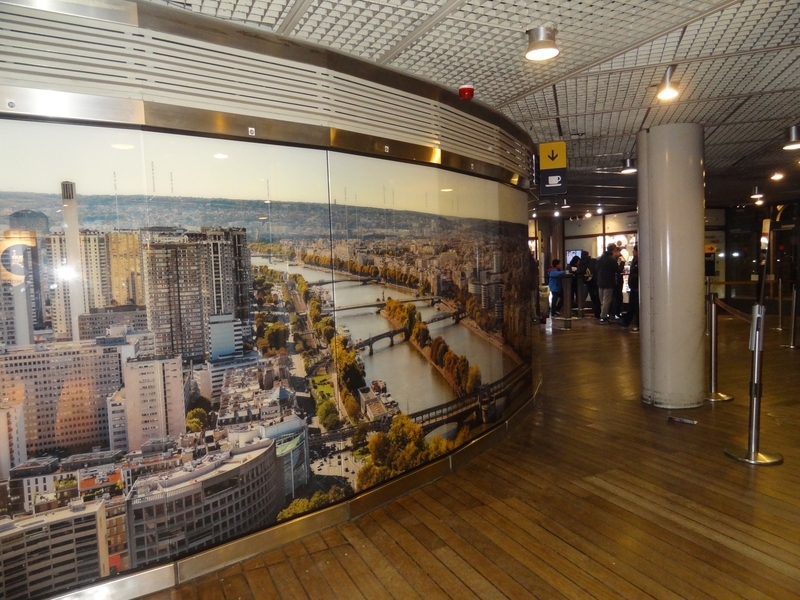 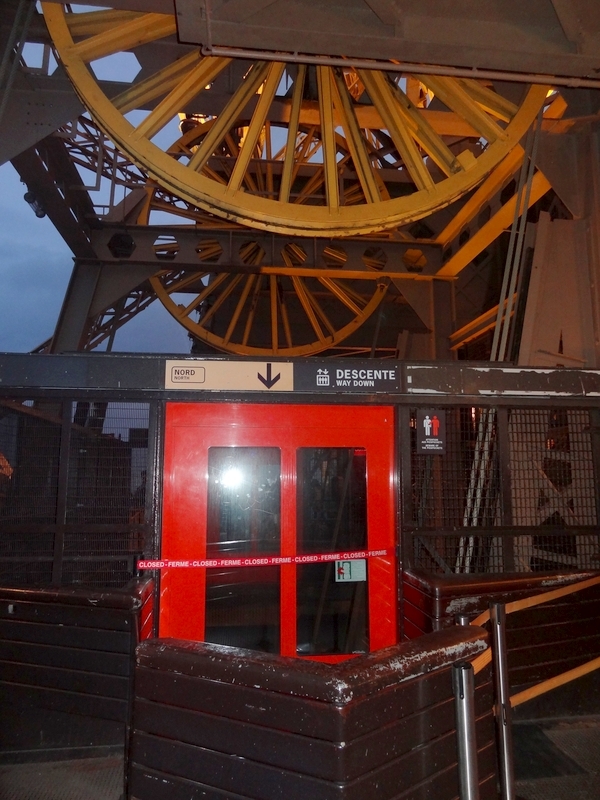 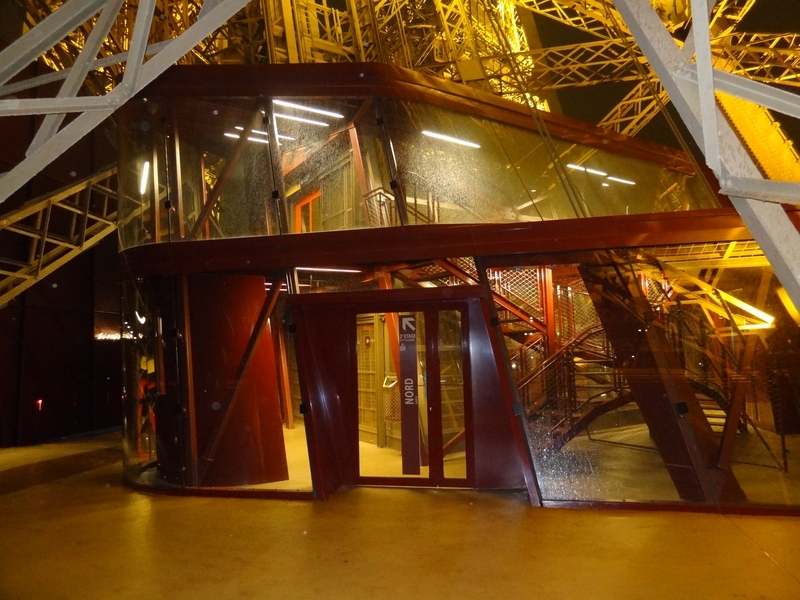 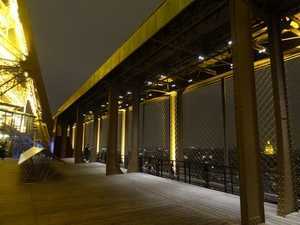 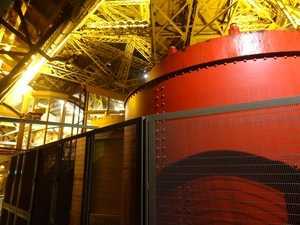 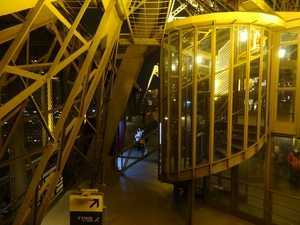 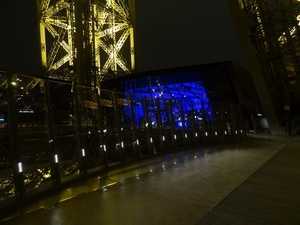 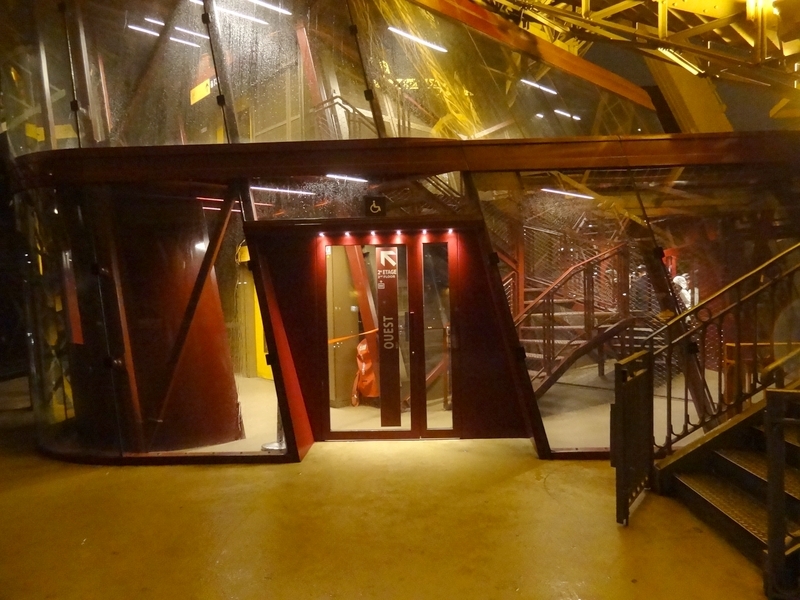 The south pillar allows you to go up on foot, or use the elevator reserved for the restaurant 'Le Jules Verne'. 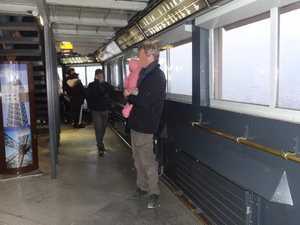 Short walk on the forecourt of the tower, then between the pillars. There are people, but it's acceptable. 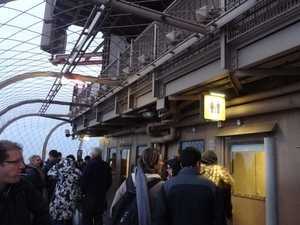 One queue is much longer than another, I'm going to the shorter one, of course. 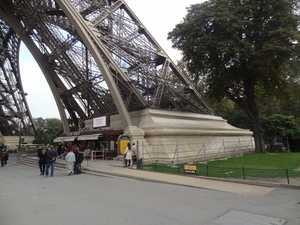 But before, a small detour is required to each of the pillars. The East pillar is one of two to allow the climb by elevator. 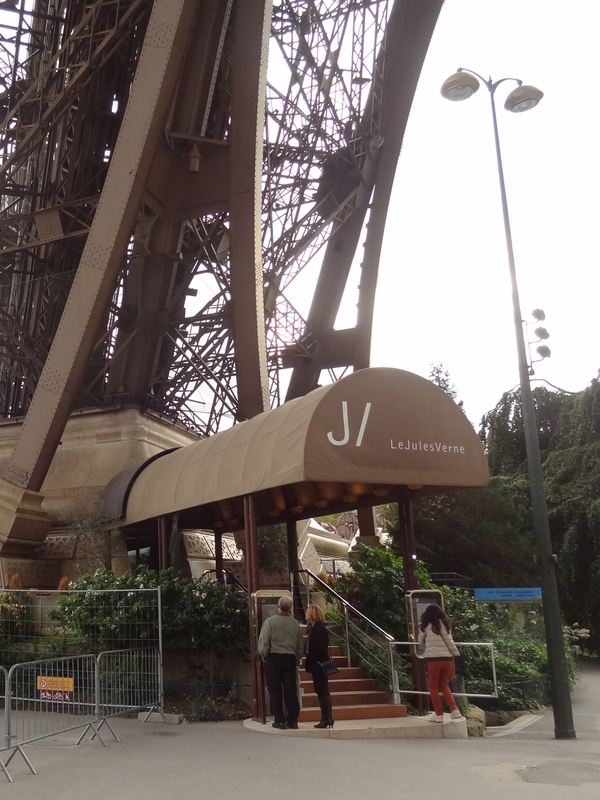 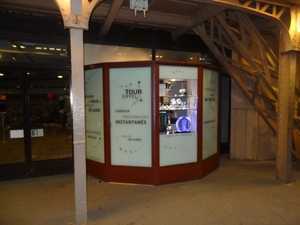 The entrance to the restaurant 'Le Jules Verne', at the southern pillar. 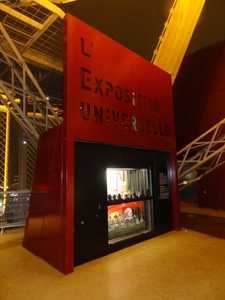 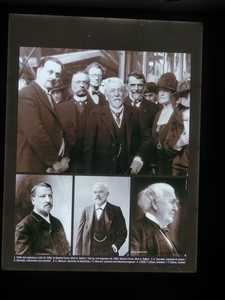 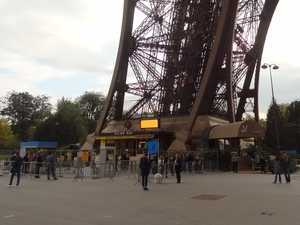 The office of the SETE, the Exploitation Company of the Eiffel Tower. 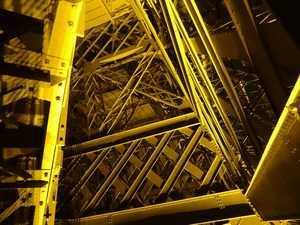 The first floor, seen from below. 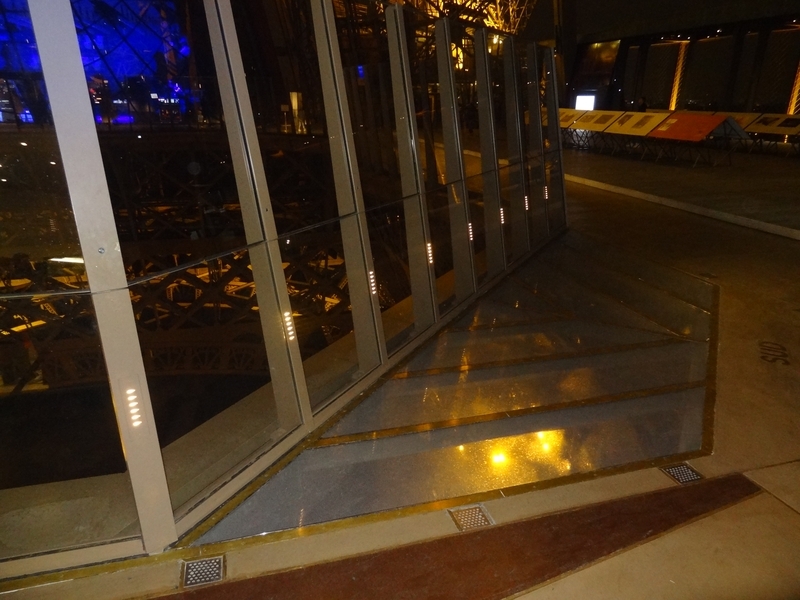 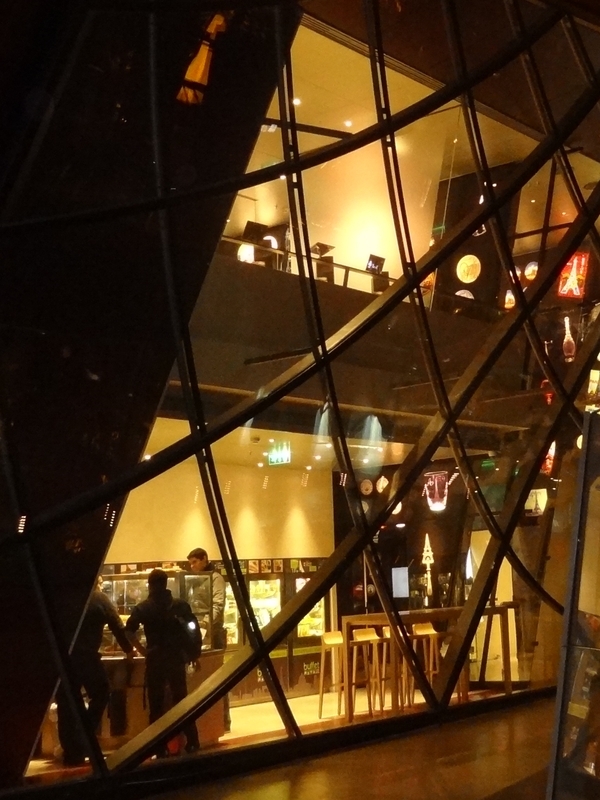 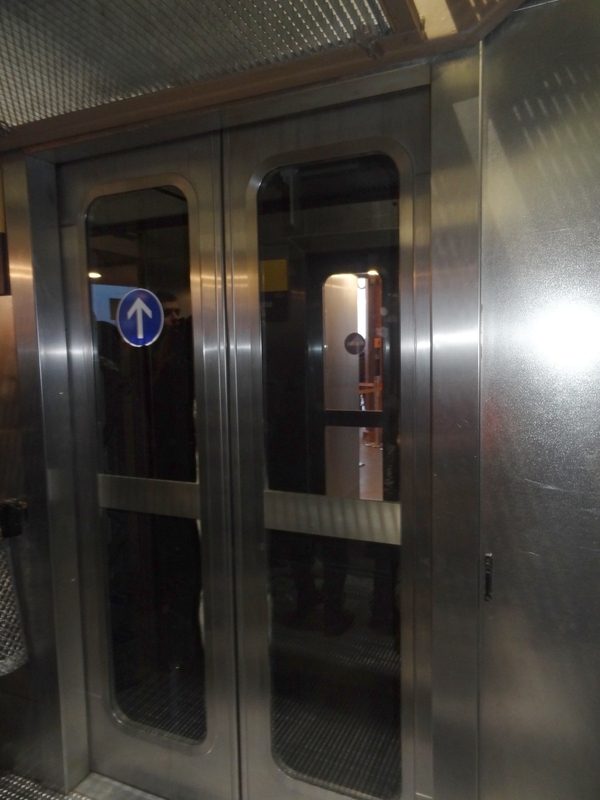 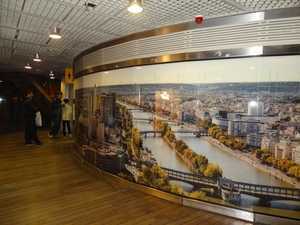 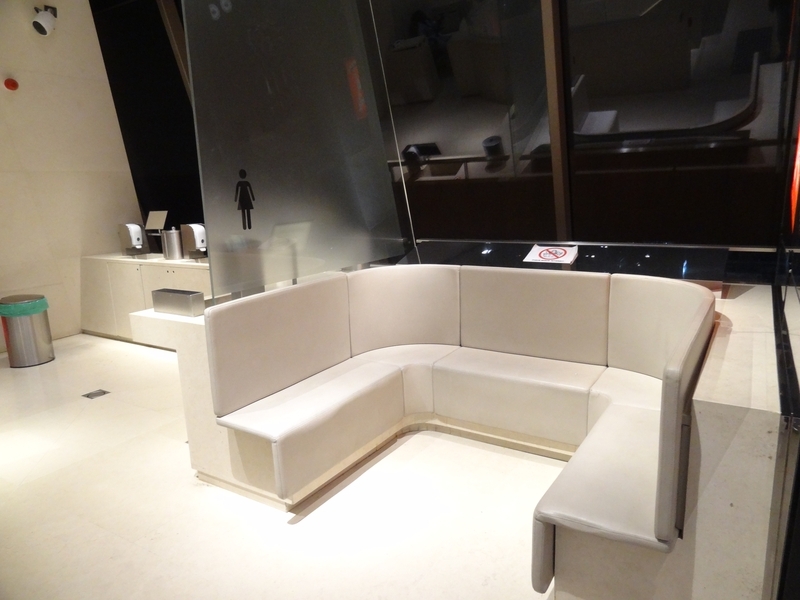 We distinguish the security barrier in glass. The Ferrié flag and the protective barriers, seen from the ground. 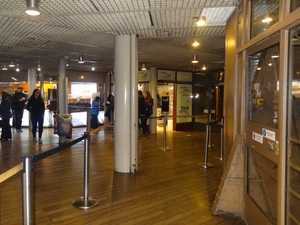 I'm in the queue, it will take me fifteen minutes only to buy my ticket. In the meantime I take some pictures of the monument, seen from here it is very impressive. 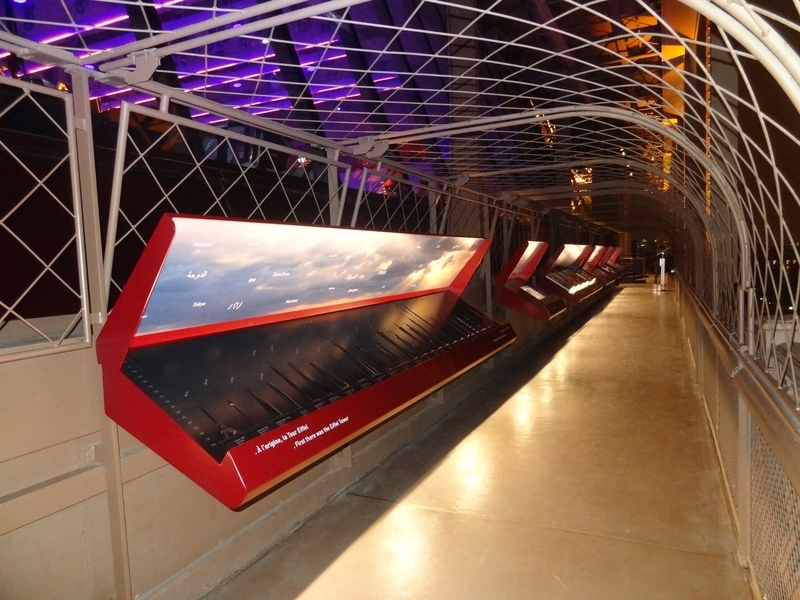 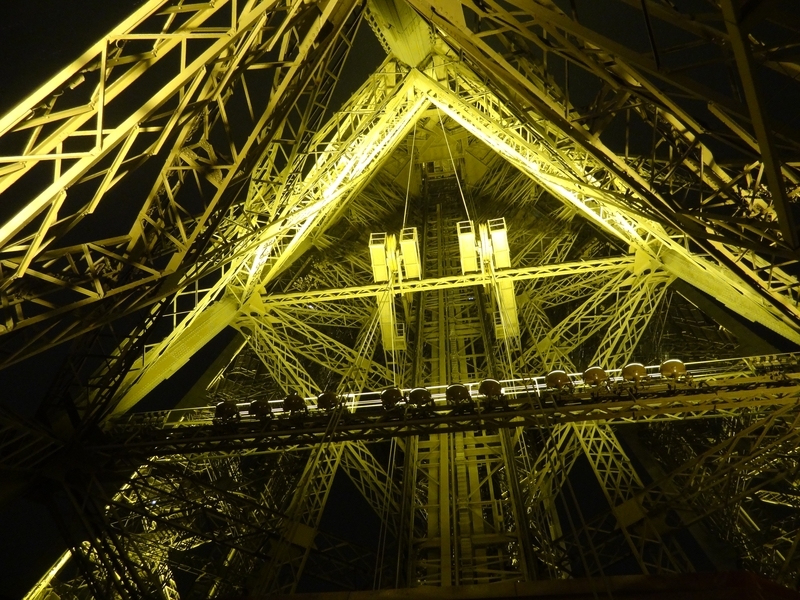 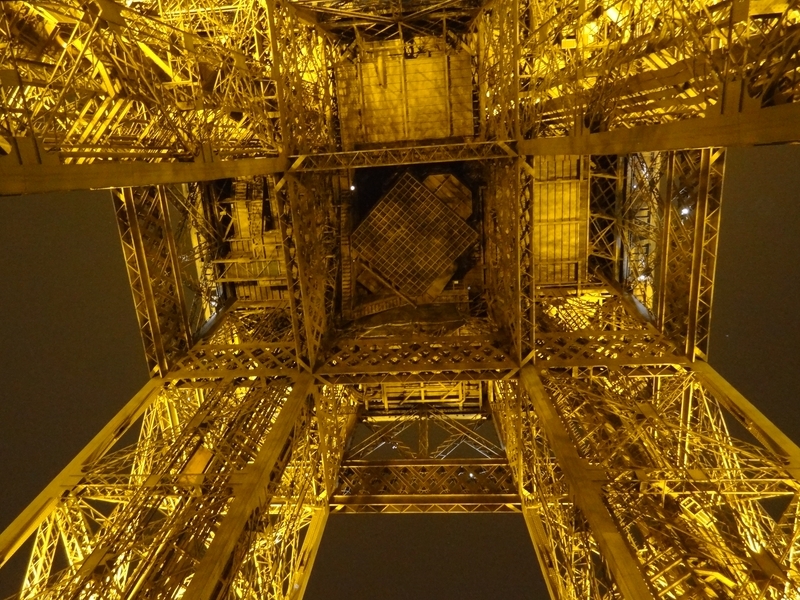 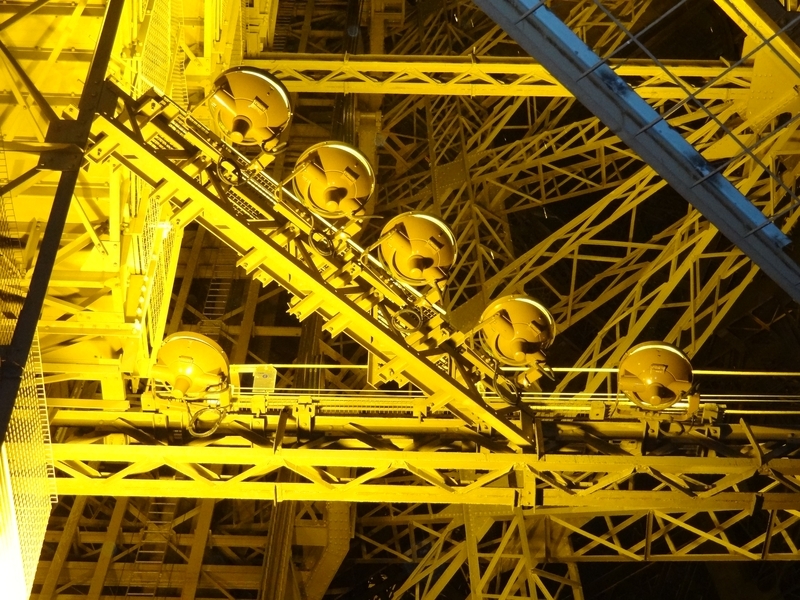 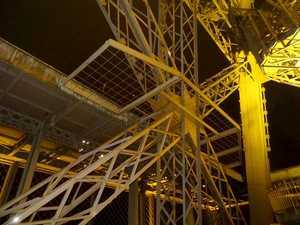 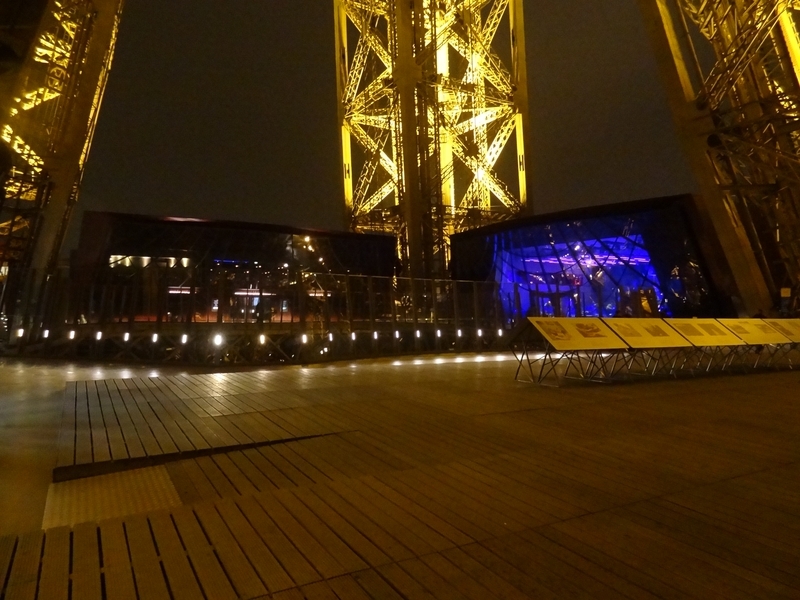 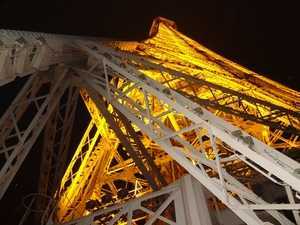 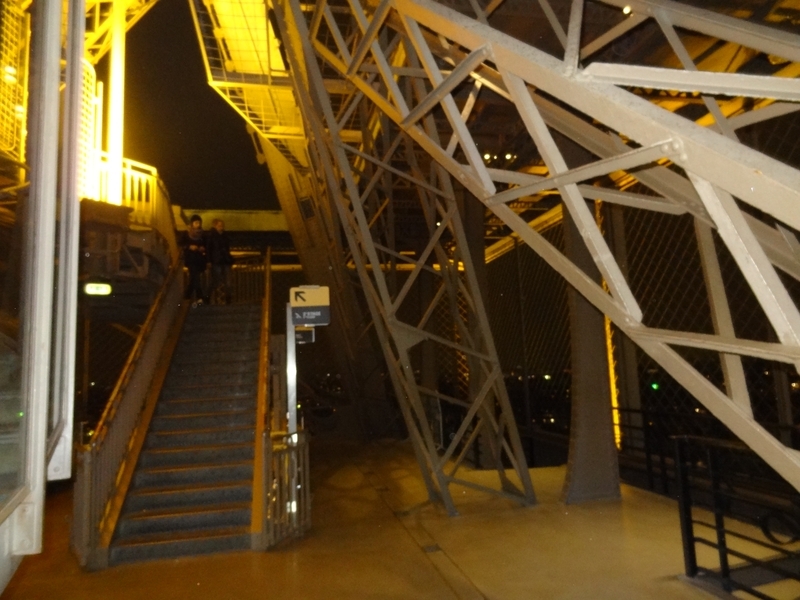 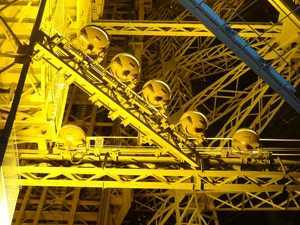 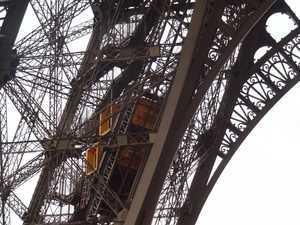 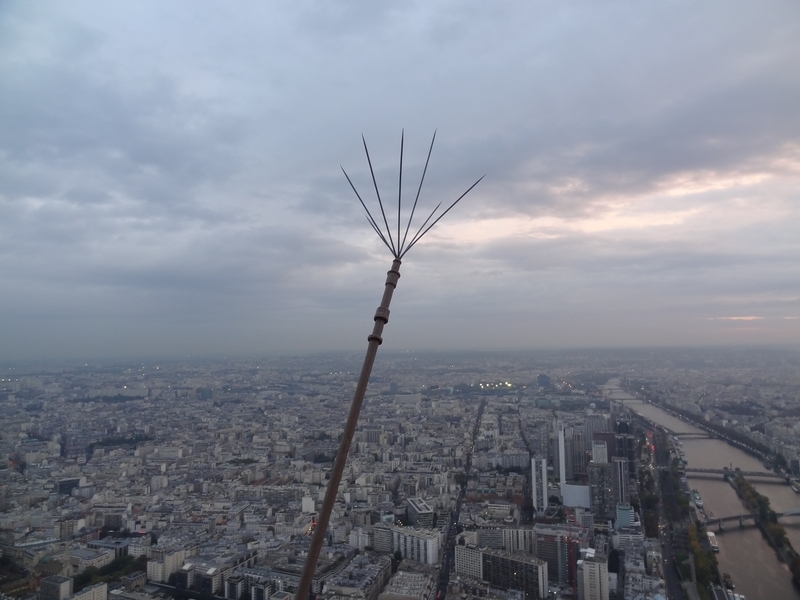 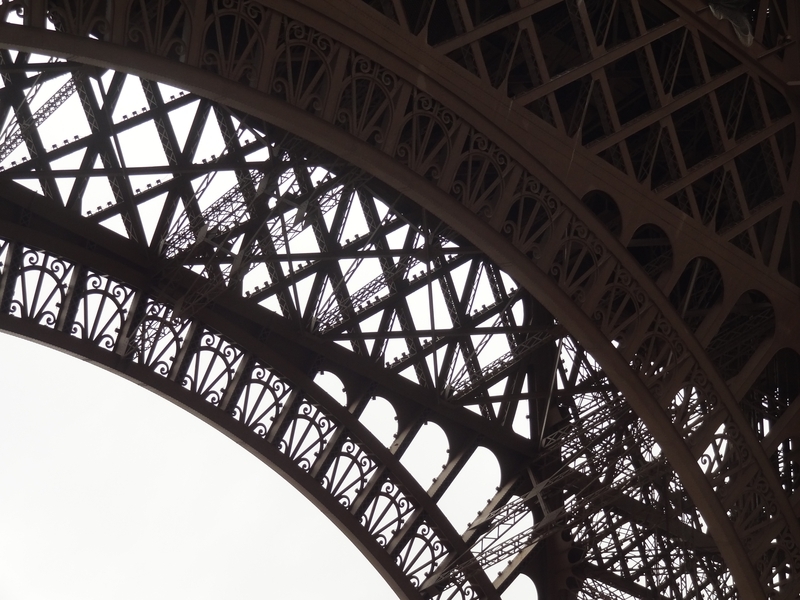 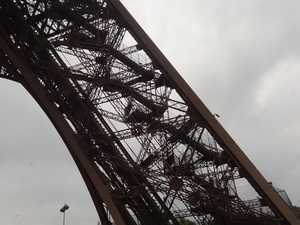 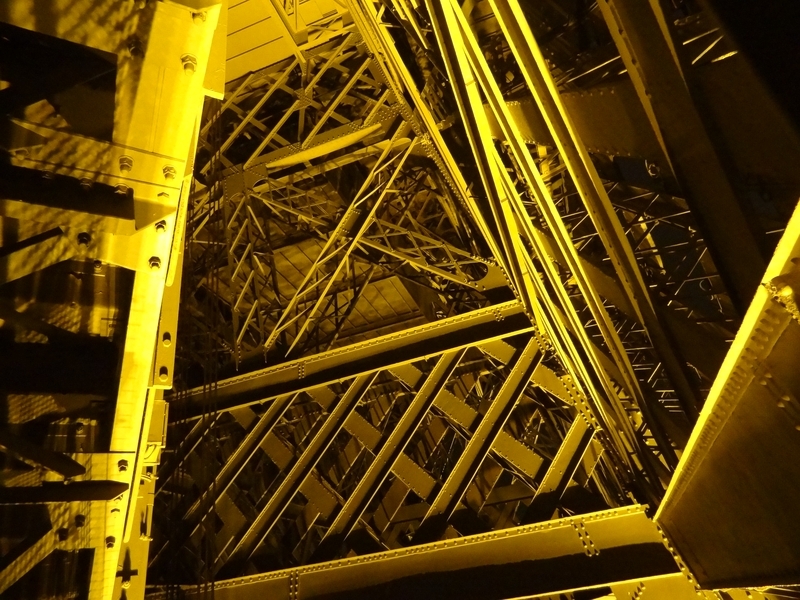 Seen from the ground, the decorative bows of the Eiffel Tower. 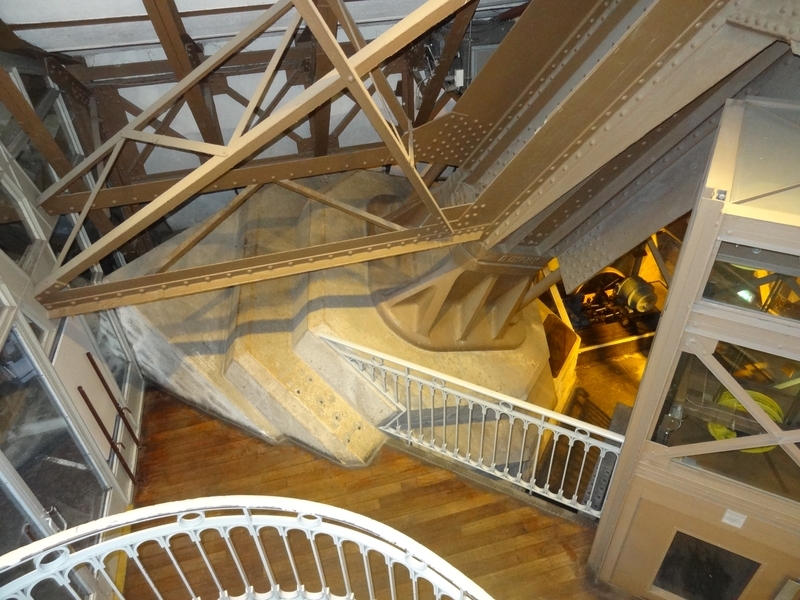 Stairs rising to the first floor, in the West pillar. 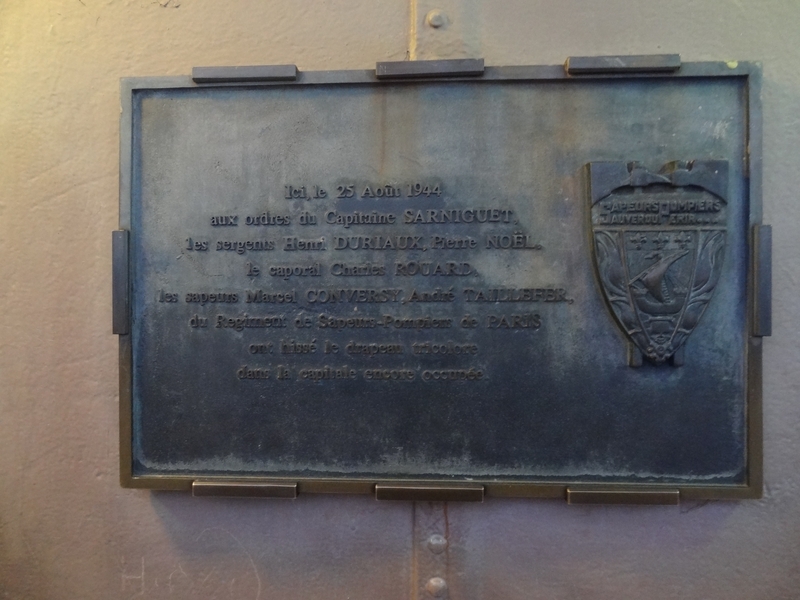 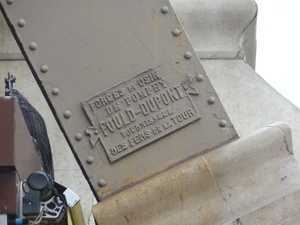 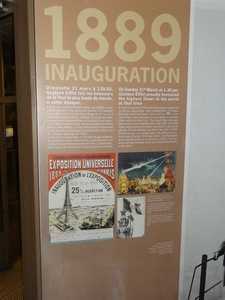 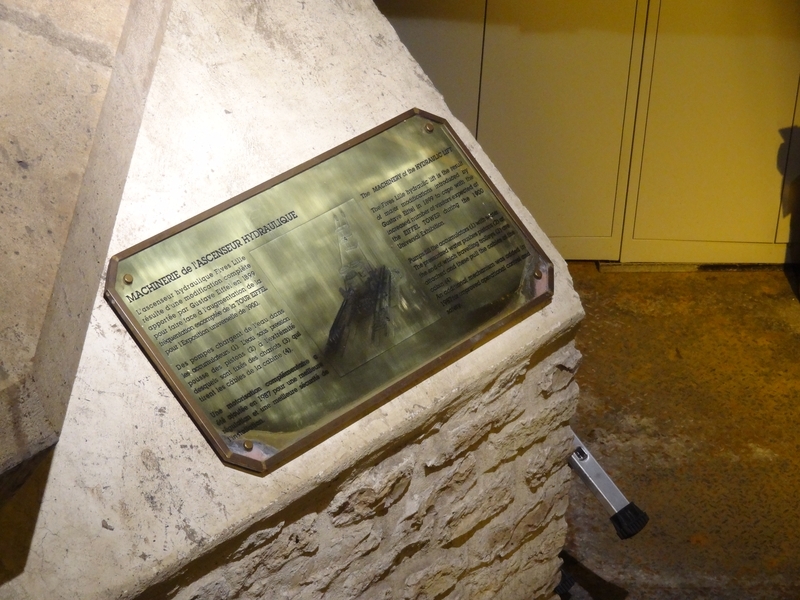 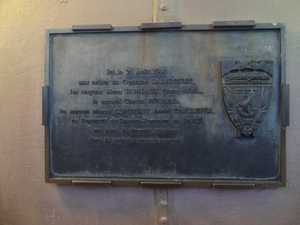 Plaque indicating the origin of the iron of the Eiffel Tower. There are several of them at the base of the crossbowmen. 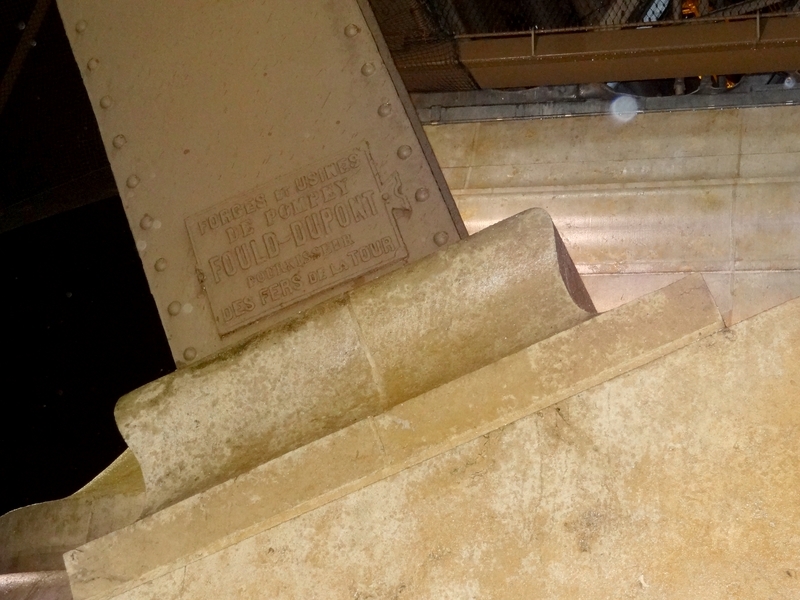 Oxidation marks on the rafters, a sign of the wear of the tower. 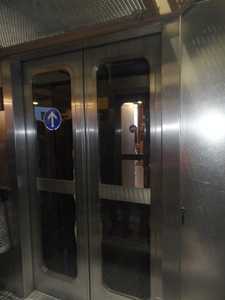 The entrance of the East Pillar, once past the safety barriers. 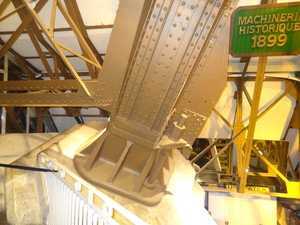 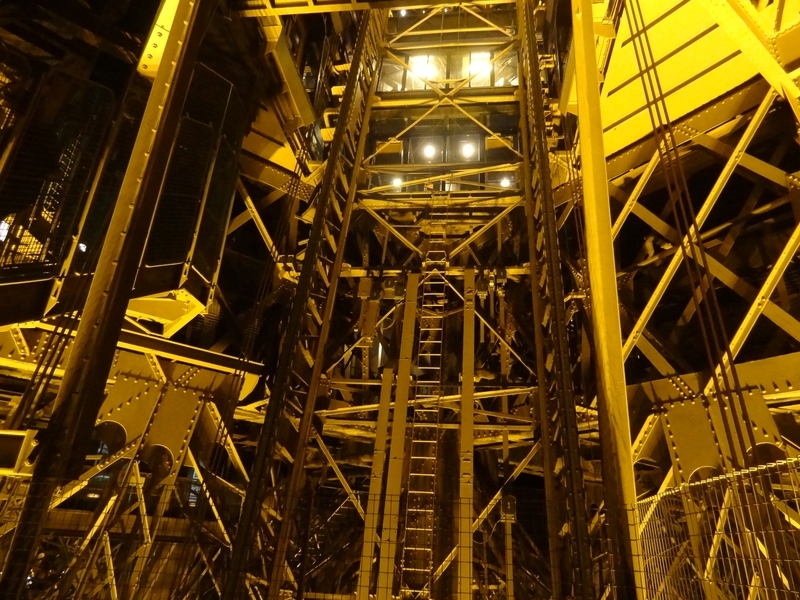 East pillar lift shaft, where counterweight tanks are seen. 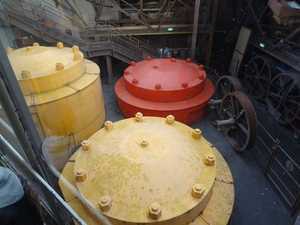 The counterweight tanks of the elevator East. They were reservoirs feeding hydraulic pumps, in 1899. The descent to the machines, in the East pillar. 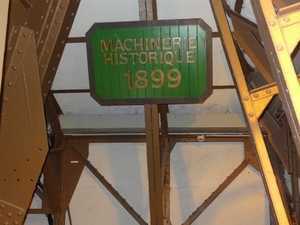 A machine from 1899, on display. 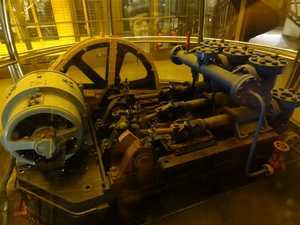 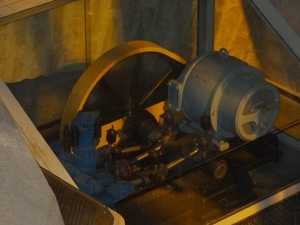 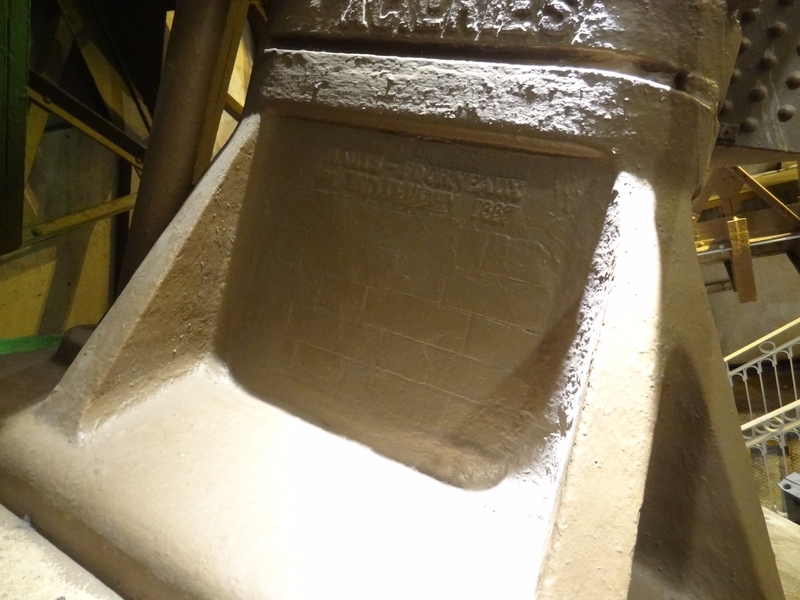 A machine from 1899, on display in the East pillar. 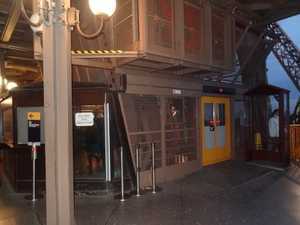 The entrance to the elevator. 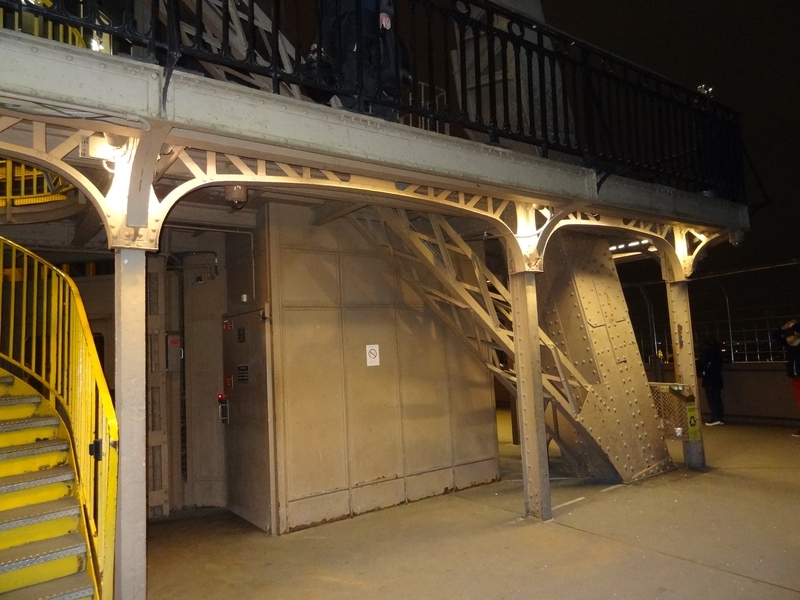 Here I am on the 2nd floor. 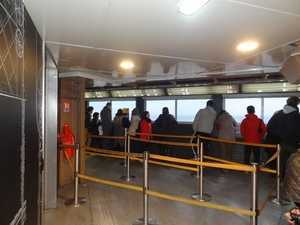 Beautiful view, but I have little time to enjoy, the guides ask me to put me in line for the third floor, like the others. 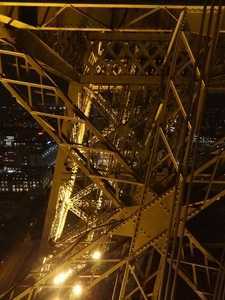 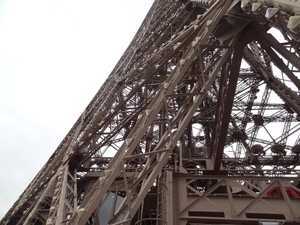 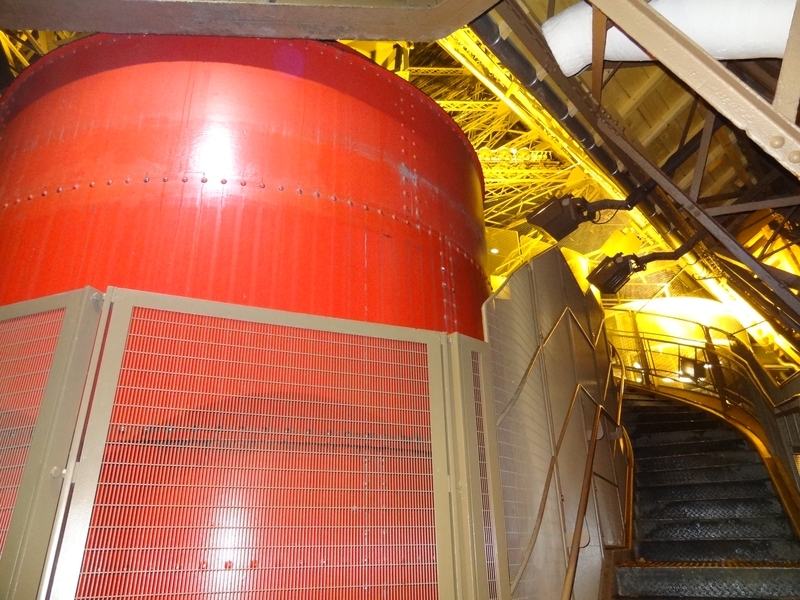 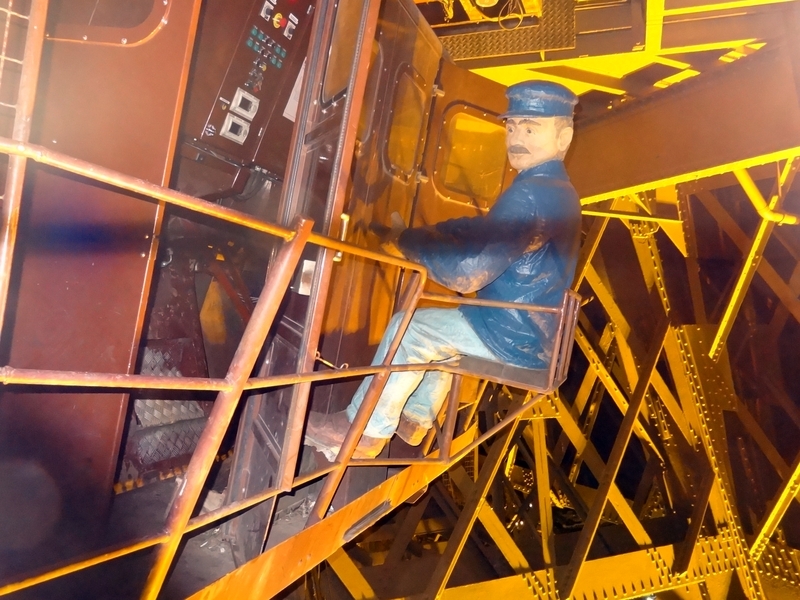 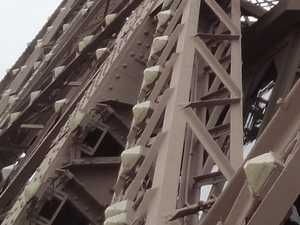 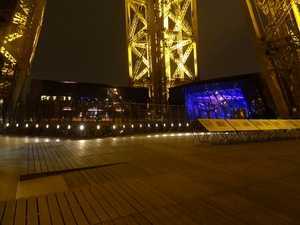 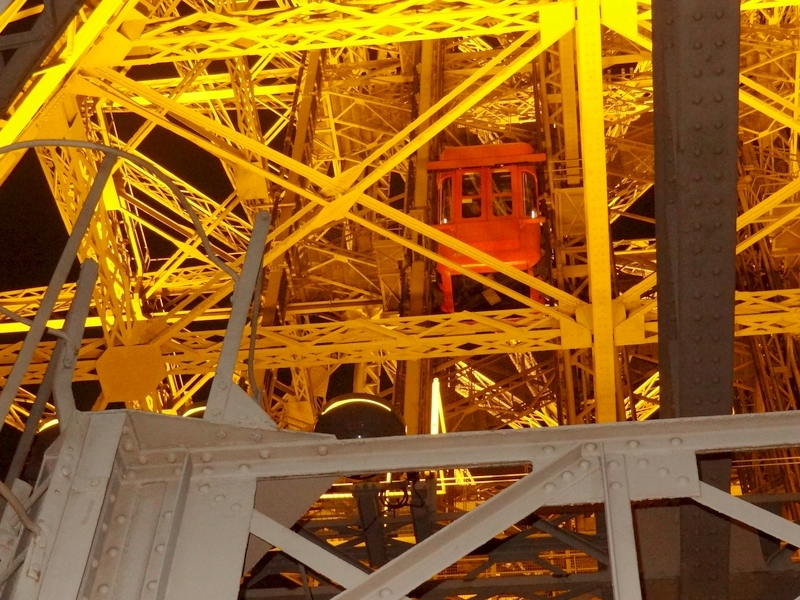 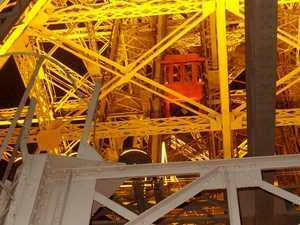 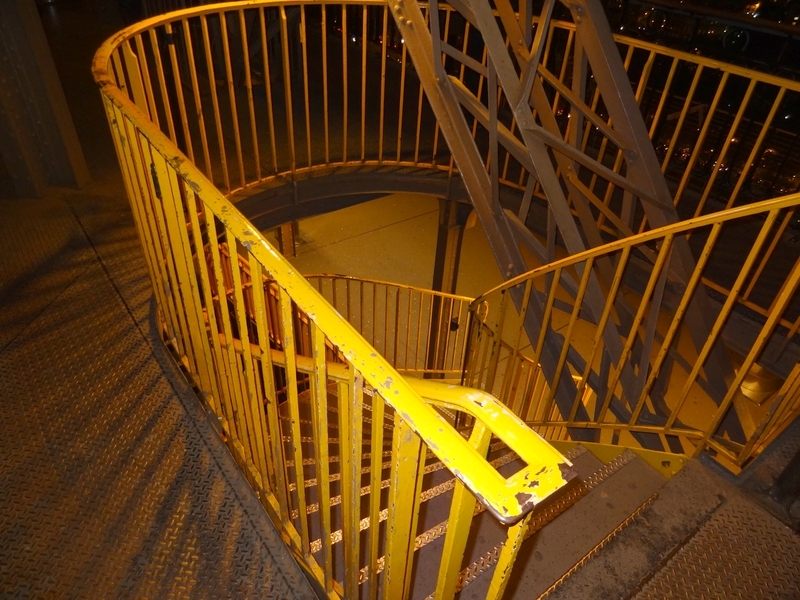 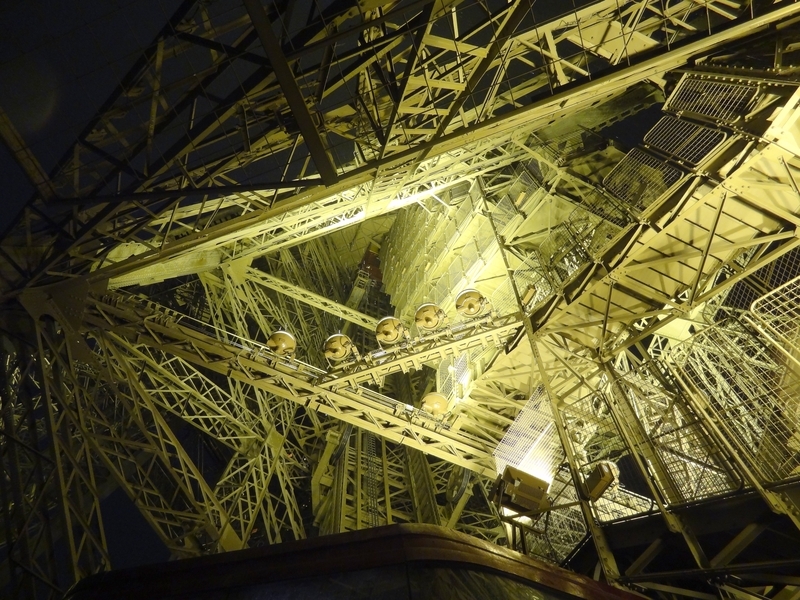 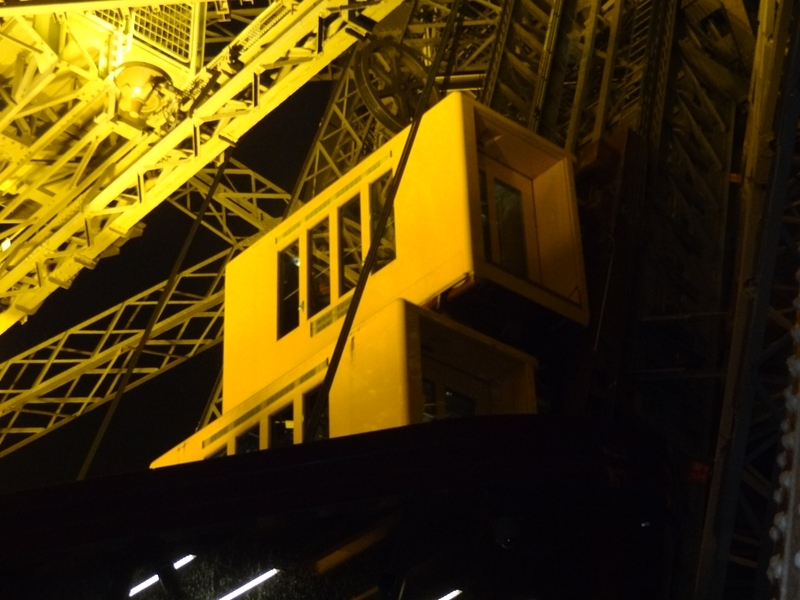 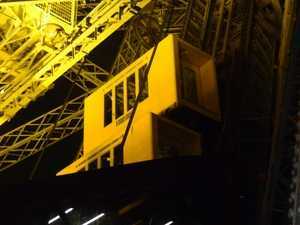 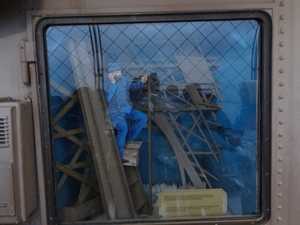 Good, fortunately it runs along the upper balcony, it allows me to enjoy the view time to dive into the heart of the tower, in the direction of vertical lifts. Well, now I'm going out on the balconies, upstairs above. Visitors can not do higher. 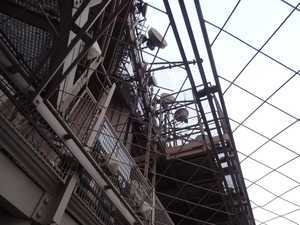 Afterwards, they are the technical machines, the antennas, the technical rooms, etc. The view is impressive, but not as much as I thought. 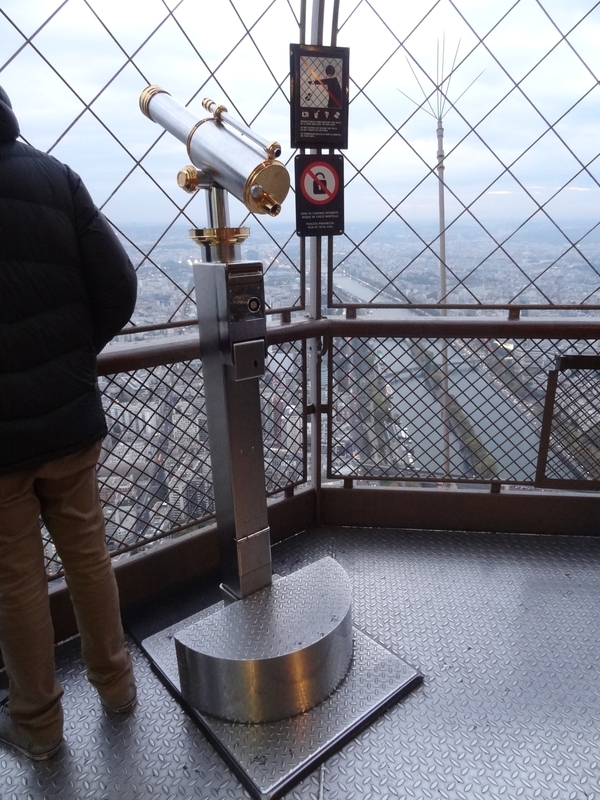 On the other hand, look down, yes, it's impressive! 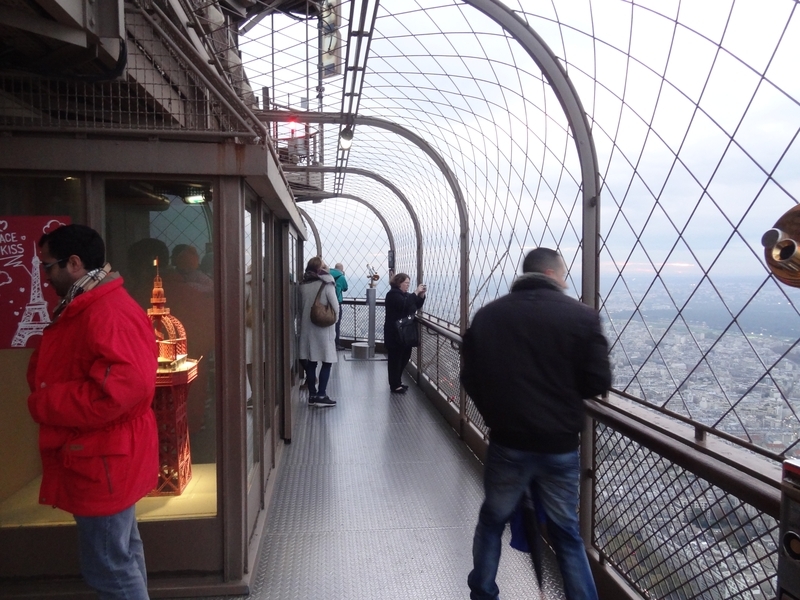 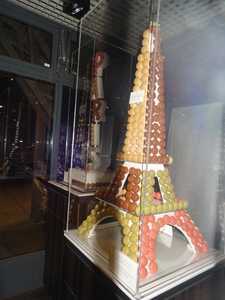 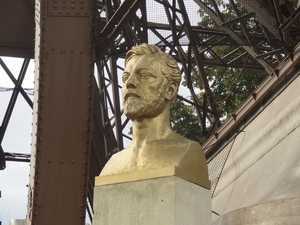 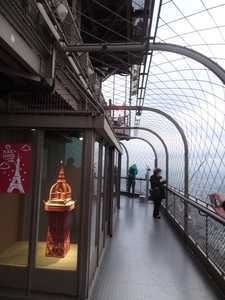 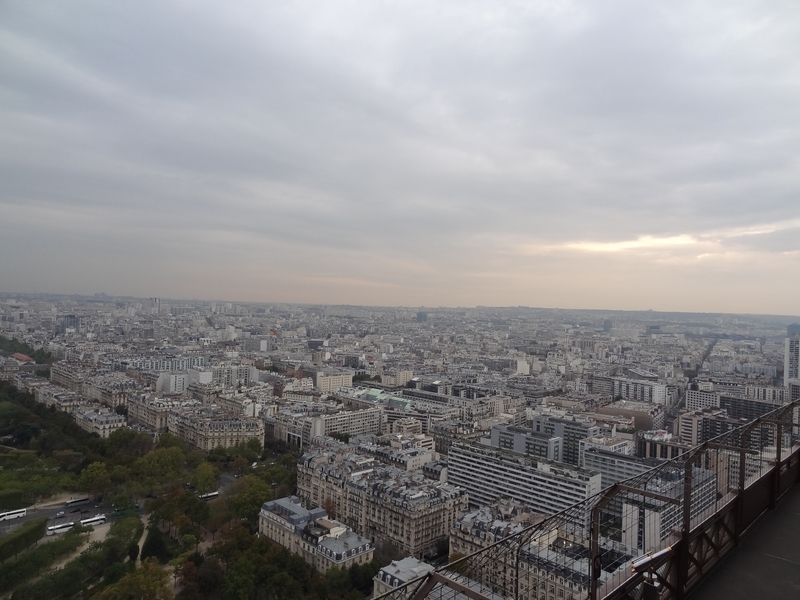 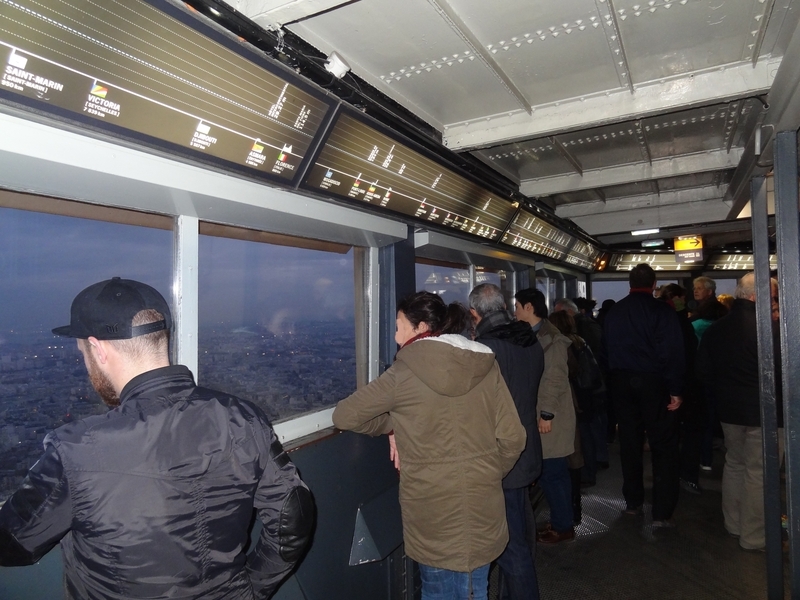 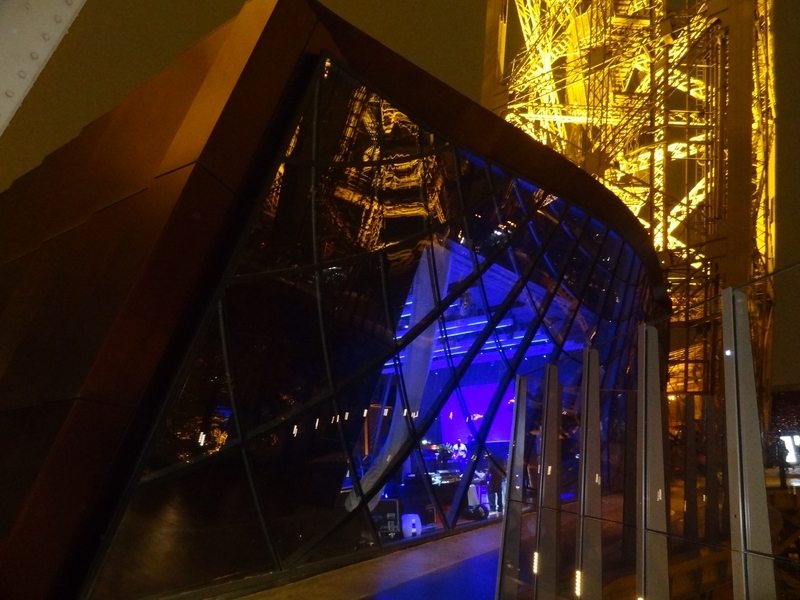 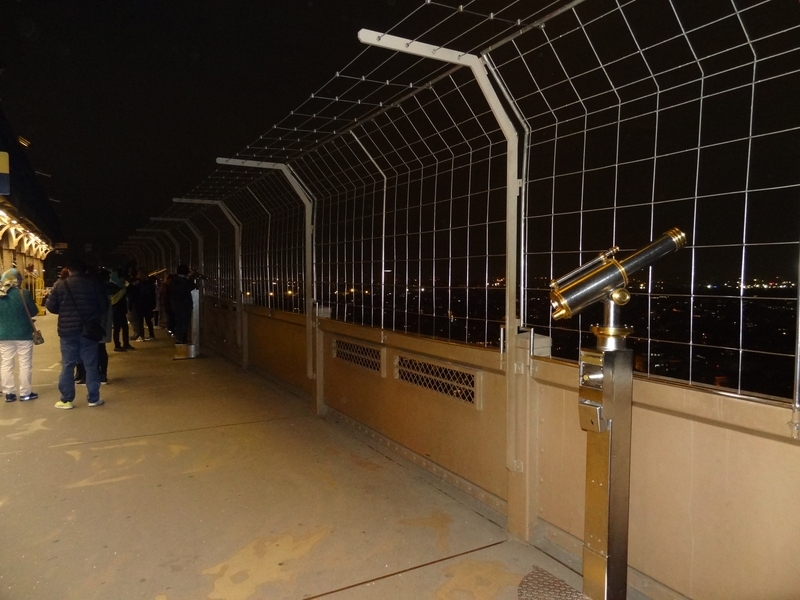 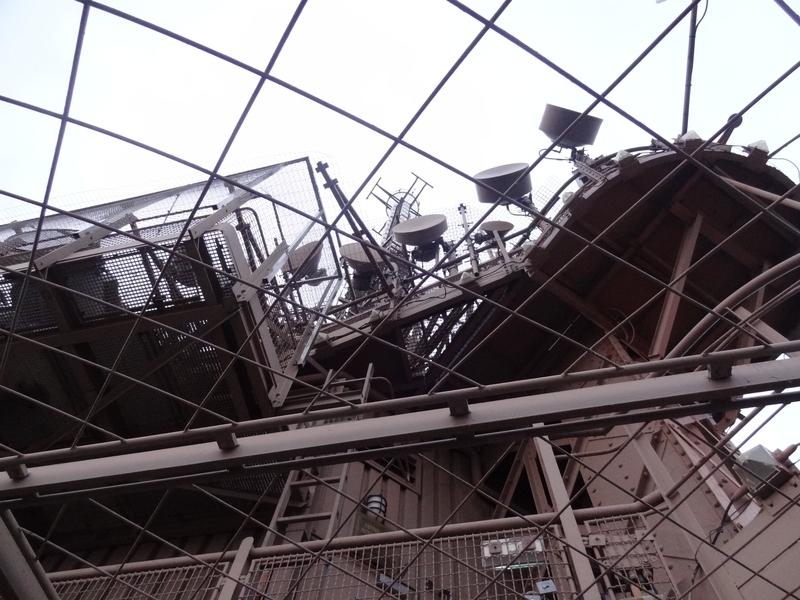 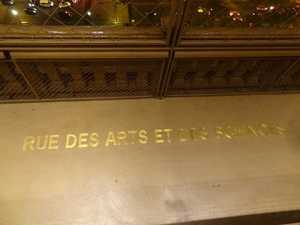 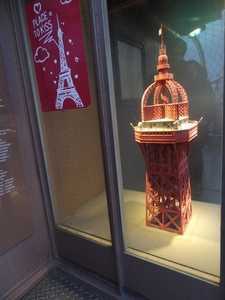 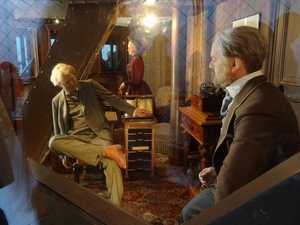 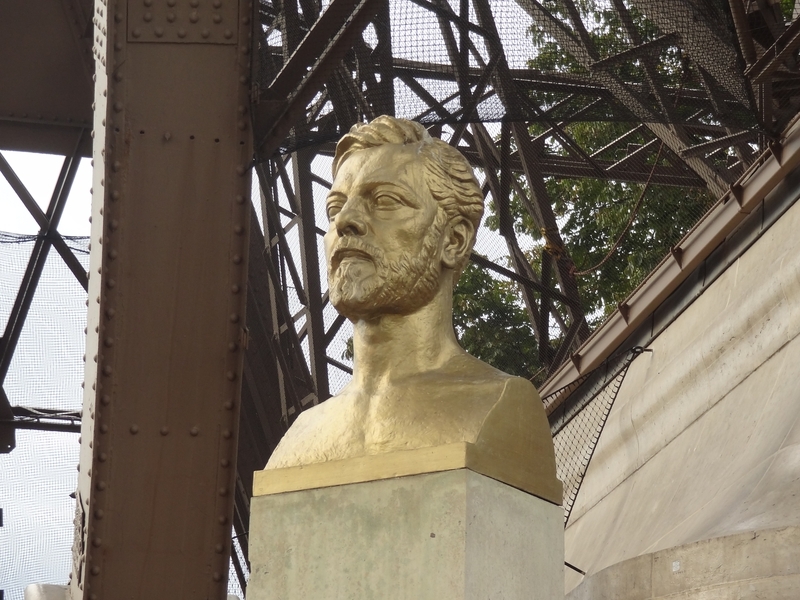 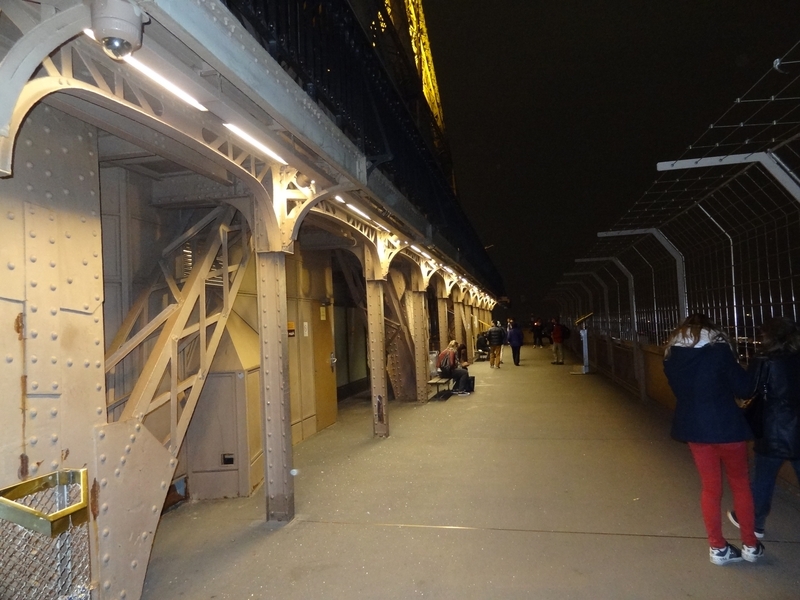 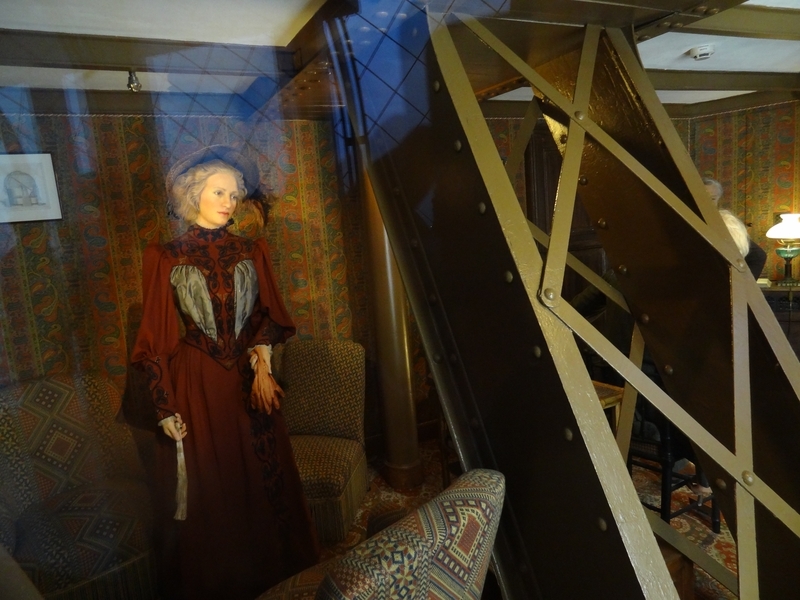 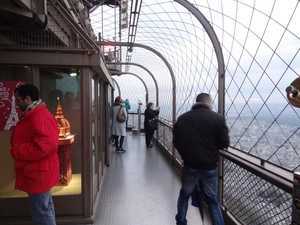 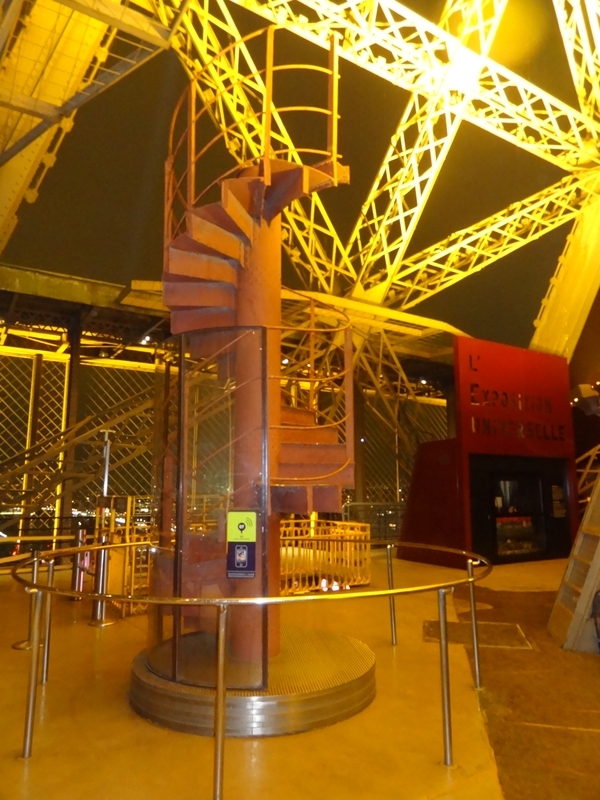 I decided to go around the balconies, there are small things rather interesting: A model of the summit as it was originally, explanatory panels, a reproduction of the office of Gustave Eiffel, and the inevitable champagne bar. 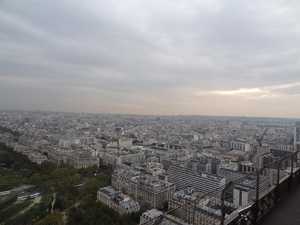 It is not very cold up there, but the wind is unpleasant. 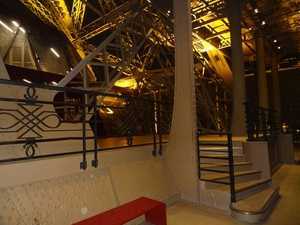 After a while I enjoy returning to the main room. I go around to travel a little: The frieze tells me the directions of major cities in the world, as well as other major monuments. 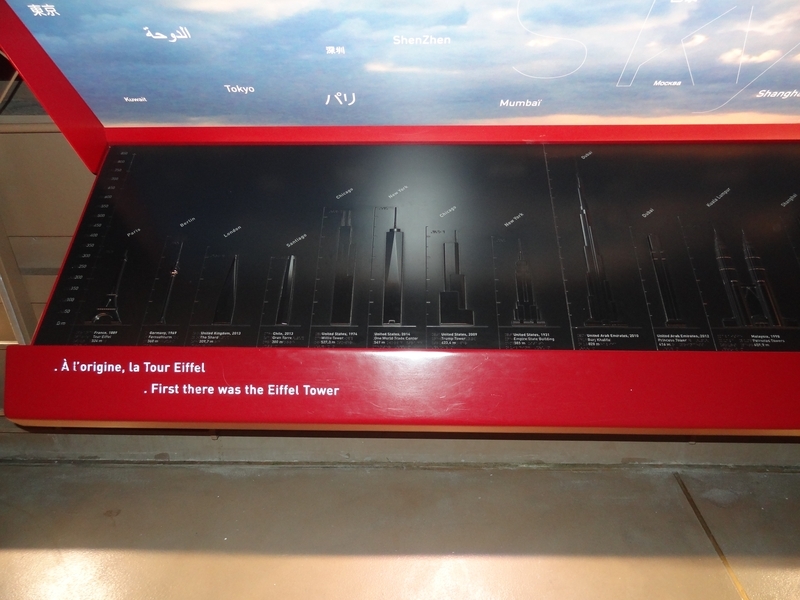 There are interesting explanatory panels too. 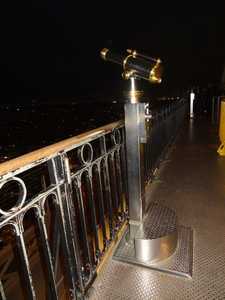 But after a while I can not wait to see what's below. 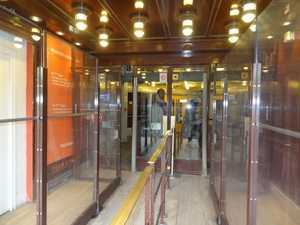 I take the elevator in the opposite direction and arrive at the 2nd floor. 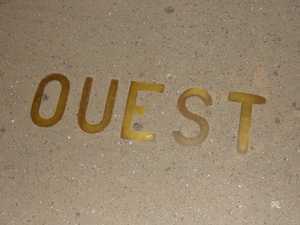 Marking directions on the ground, 1st floor. 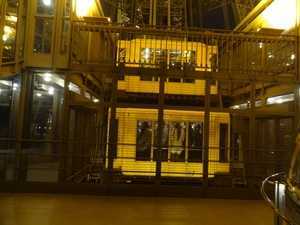 The 2nd level is quite fast, apart from the elevators for the 3rd there is only the shop and balconies. So I go down below, the balconies are wider, more beautiful too. 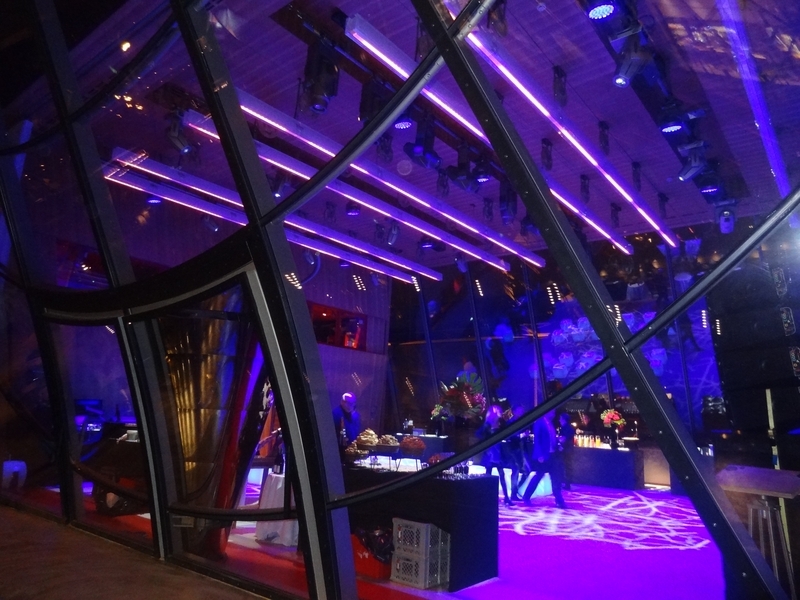 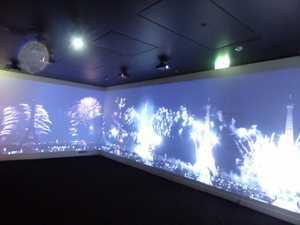 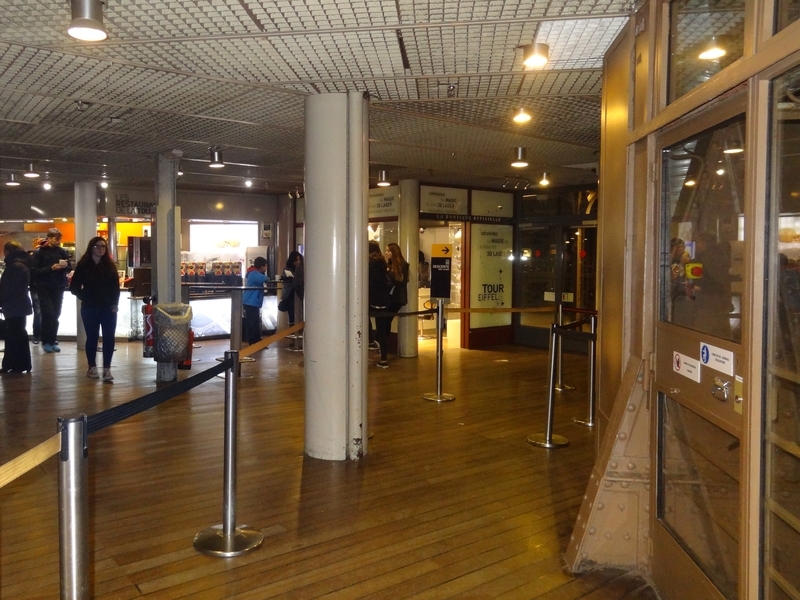 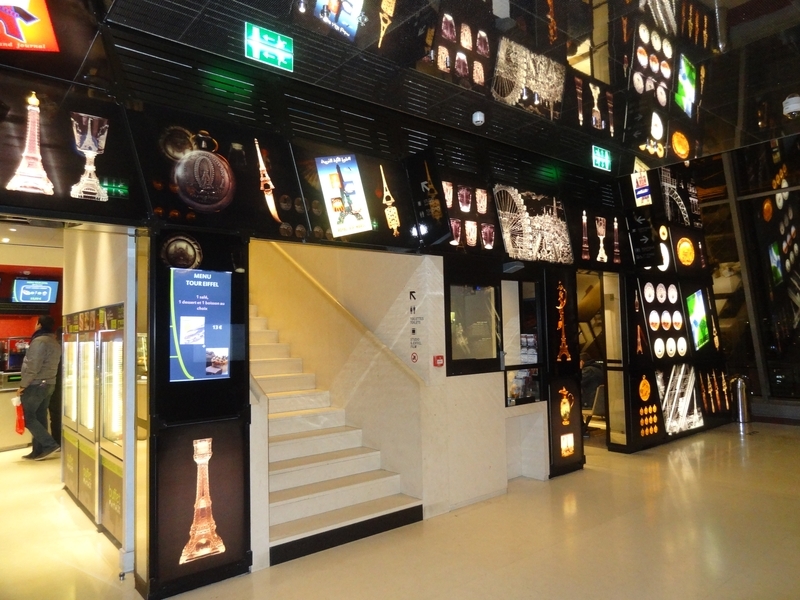 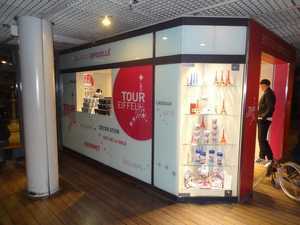 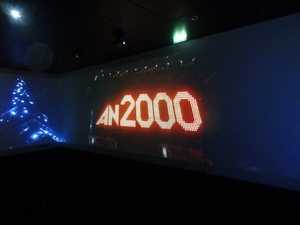 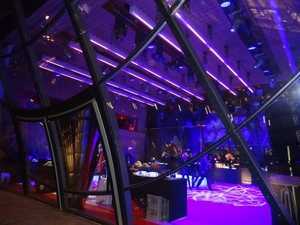 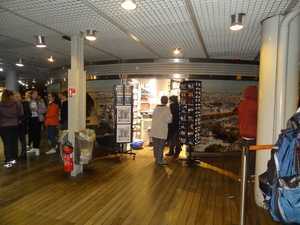 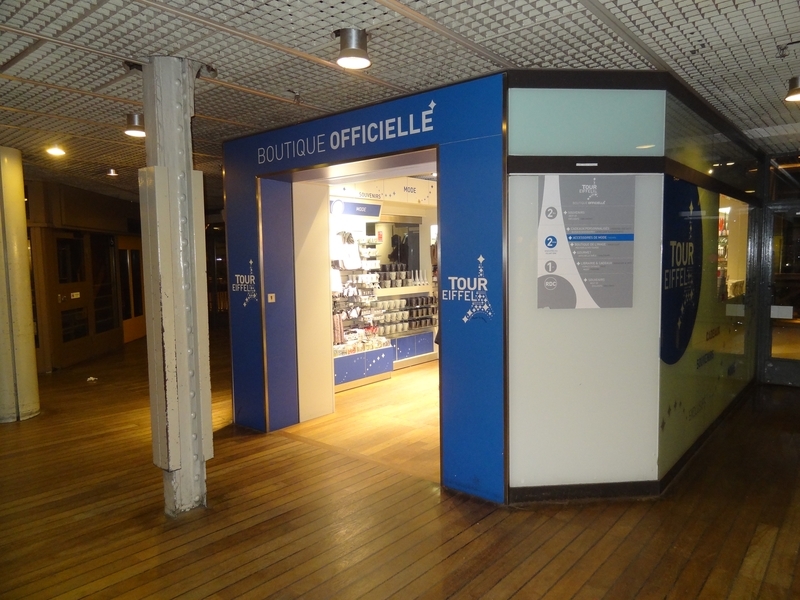 They allow you to enter the big room, the one that contains several shops (called "Official"! 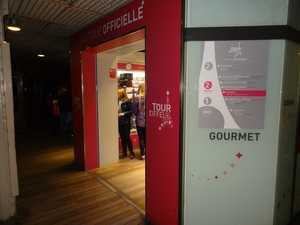 ), A catering point, the bar with macaroons, and some other less useful places. 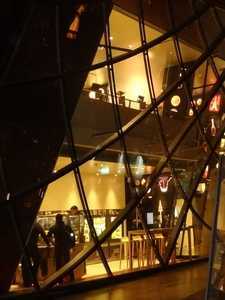 I go there quietly, taking advantage of the lack of attendance in the early evening. A cafeteria on the second floor of the tower. 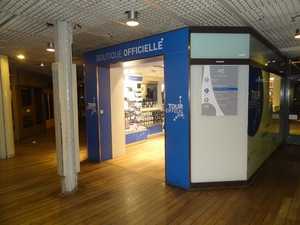 The hall of the 2nd floor, opening on the shops, the cafeteria, etc. 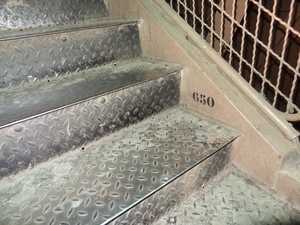 It's time for me to go downstairs. 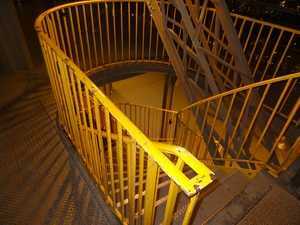 I do not want to take the elevator, I have a staircase that is offered to me. 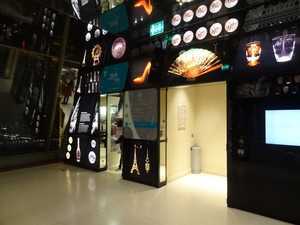 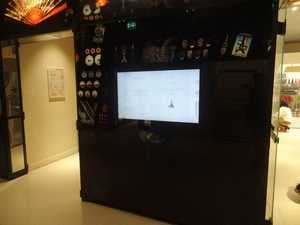 It seems more interesting, and I did well because I cross the elevator, which allows me to see the manikin that simulates the role of the machinist, before its replacement by electronic systems controlled from the inside. 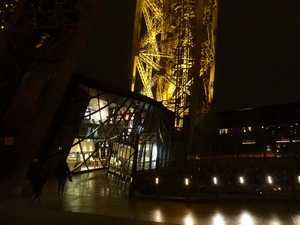 Come on, a little courage, and I have to get more exercise, so now is the time or never. 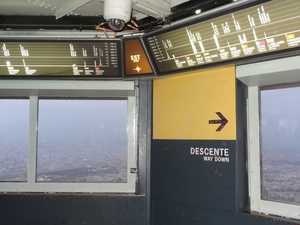 Anyway, downhill, it's easy. 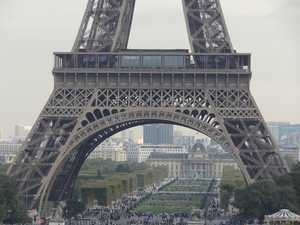 The steps of the Eiffel Tower are numbered; as it is shown in this picture. 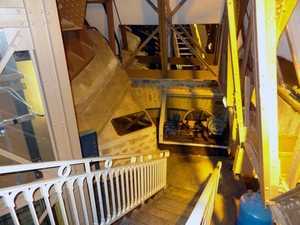 The elevator shaft West, during the descent between the 2nd and 1st floor. 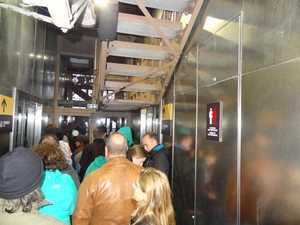 Departure of the stairs between the 1st and 2nd floor. It is on the 1st floor. The main esplanade of the 1st floor is lined with arcades recalling the style of the past. 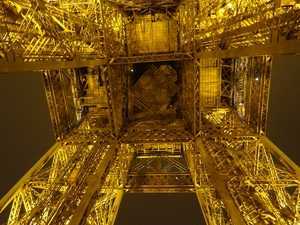 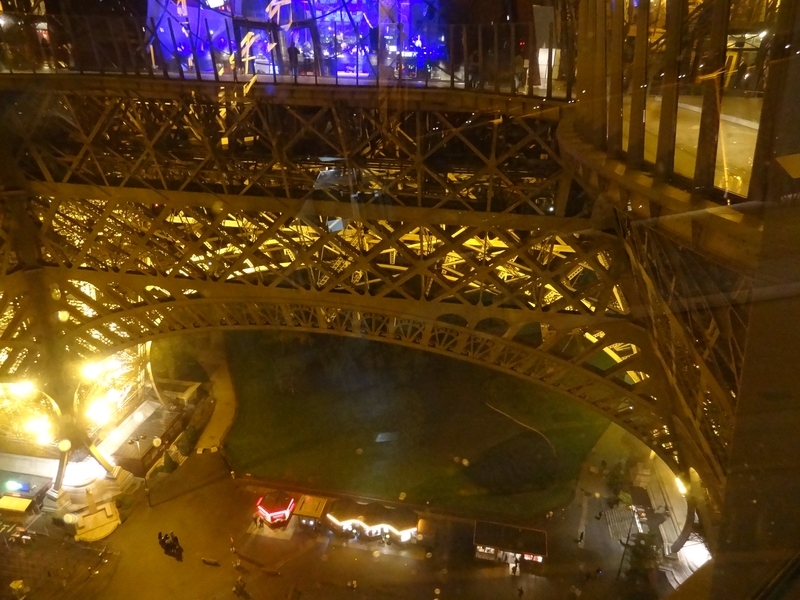 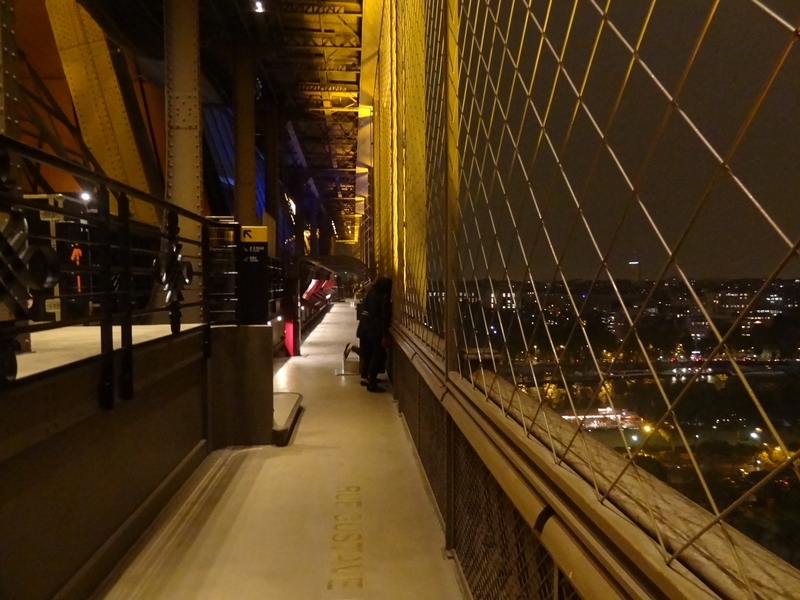 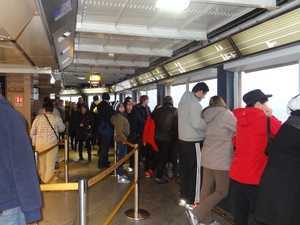 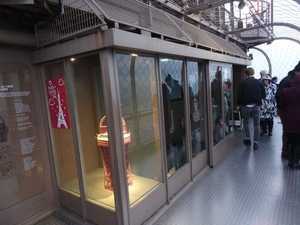 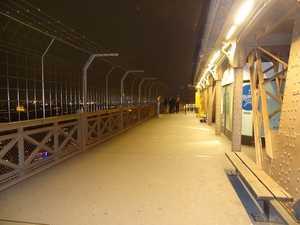 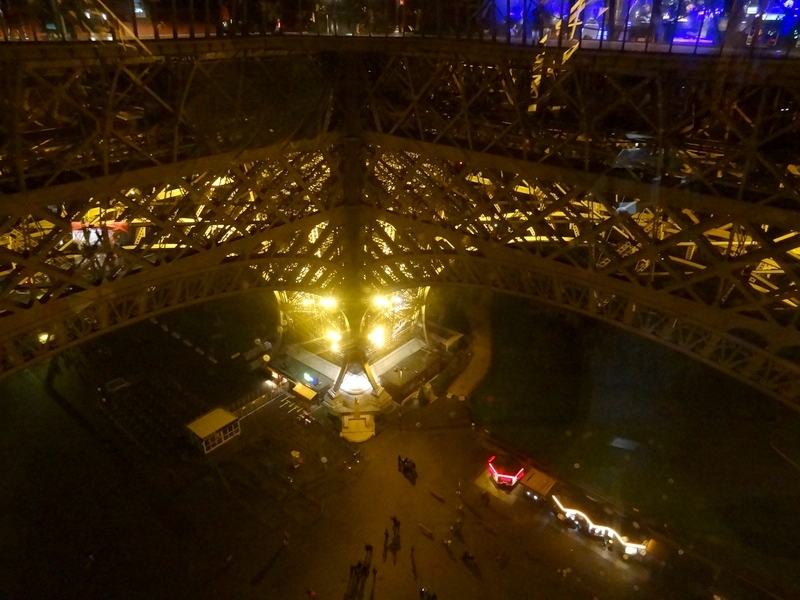 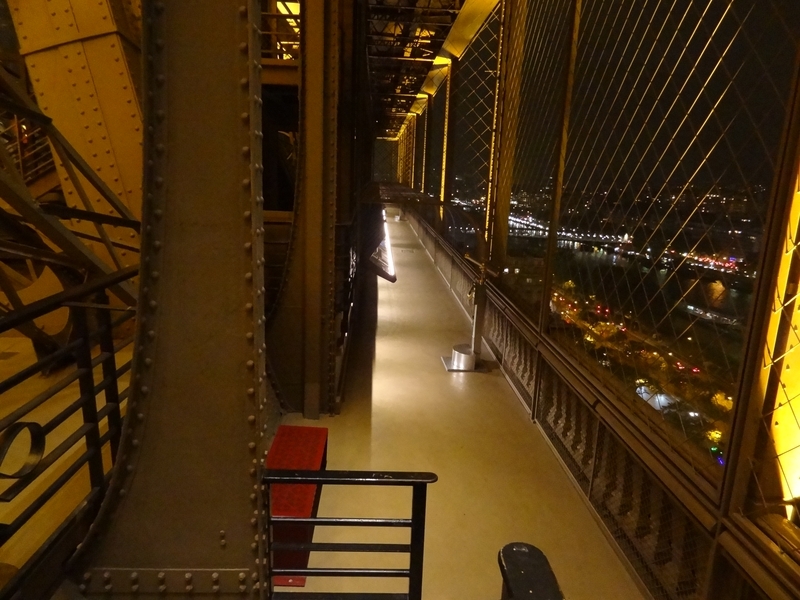 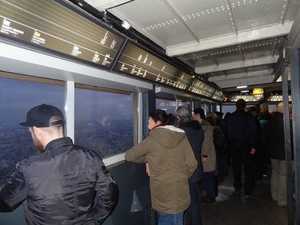 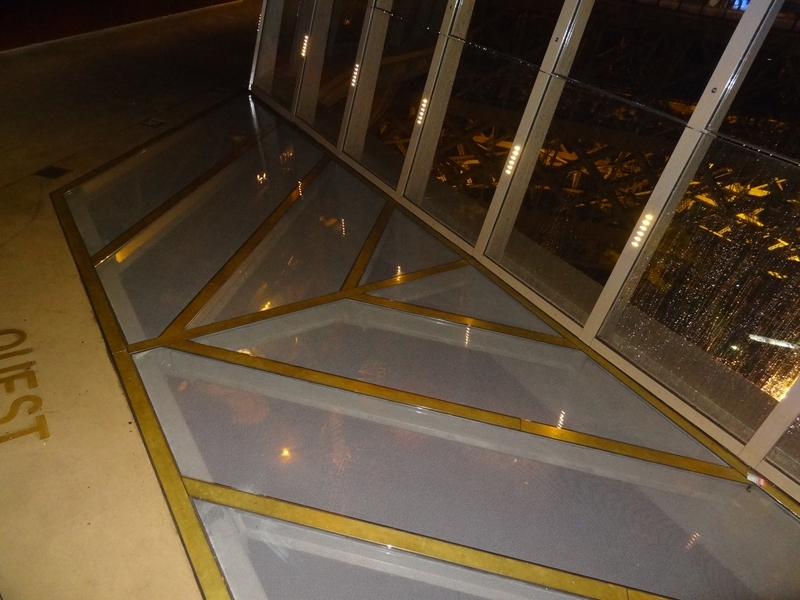 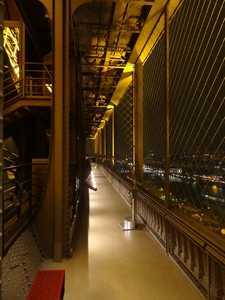 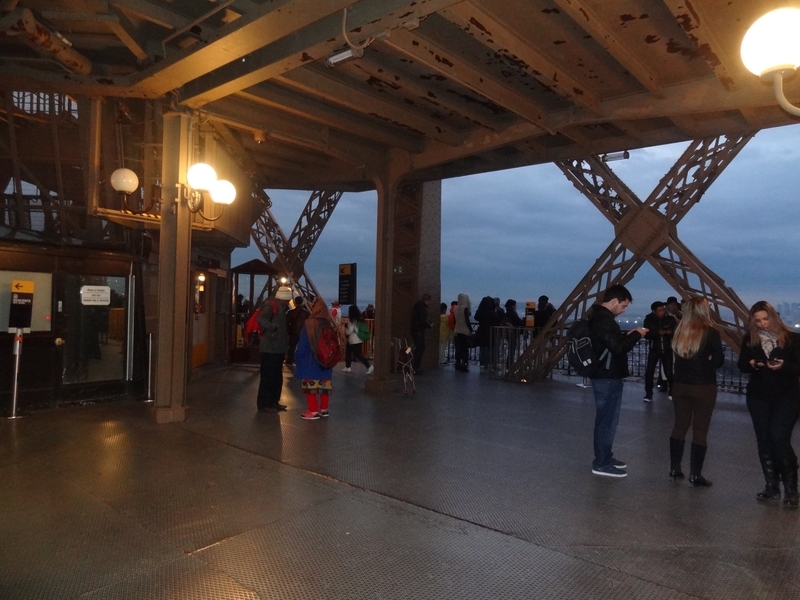 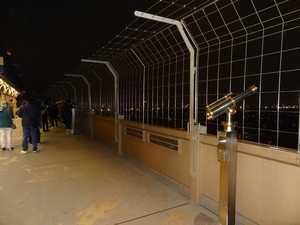 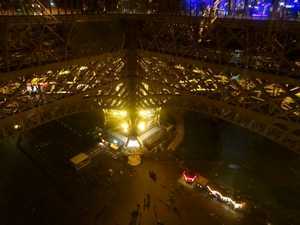 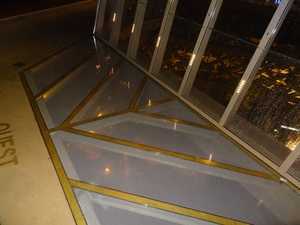 One of the 8 glass floors of the Eiffel Tower. 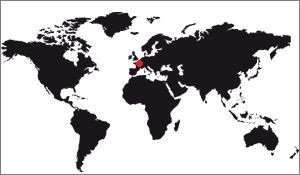 They are not very big, but many. 2nd floor architecture from below and 1st floor. Back to the esplanade I detail what there is and that I had not really seen when I arrived, just guessed: The kiosk recalling the World Fair of 1889, for which the tower was built, a piece of the original staircase, with the original color precisely, and various little things of the same type. 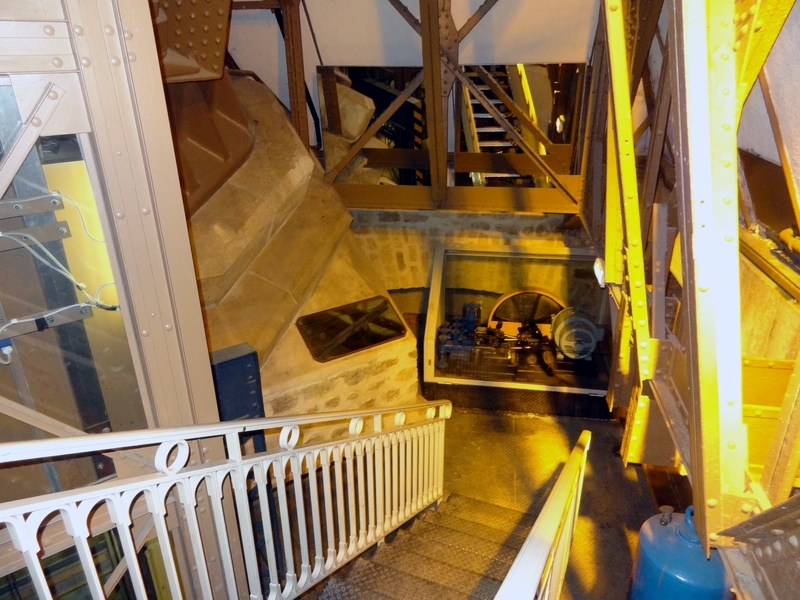 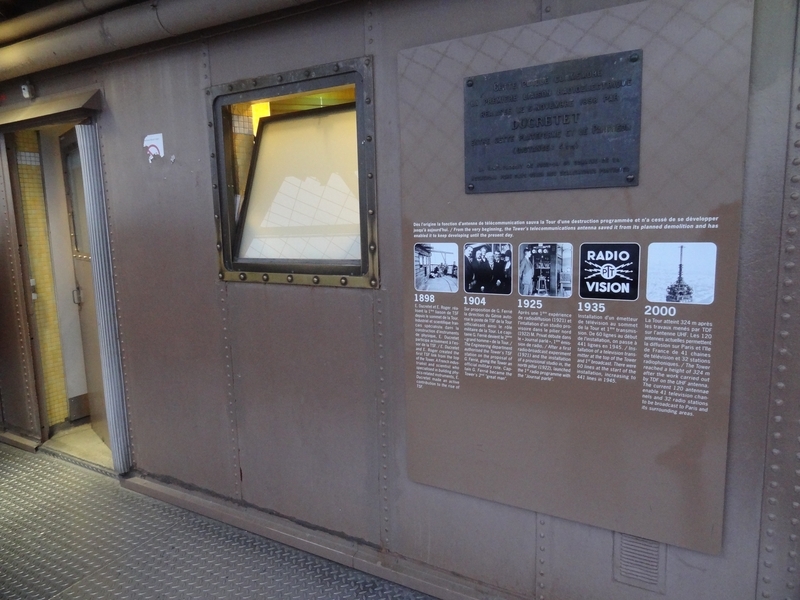 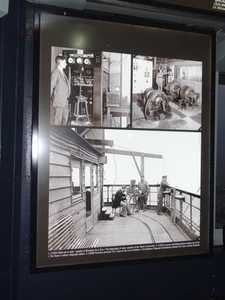 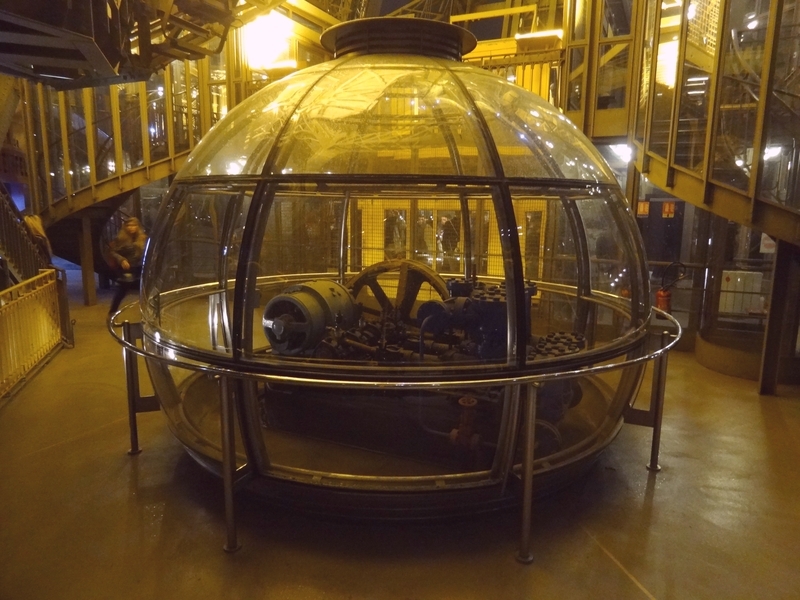 There is even the Edoux pump that was used to supply water to the hydraulic lift that "pushed" visitors to the third floor, via a landing. 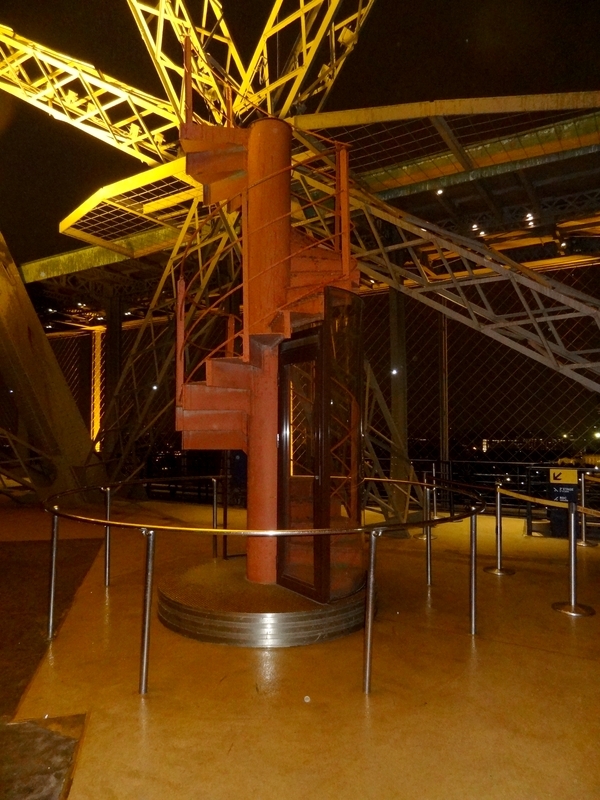 Staircase rising on the 2nd floor, at night. 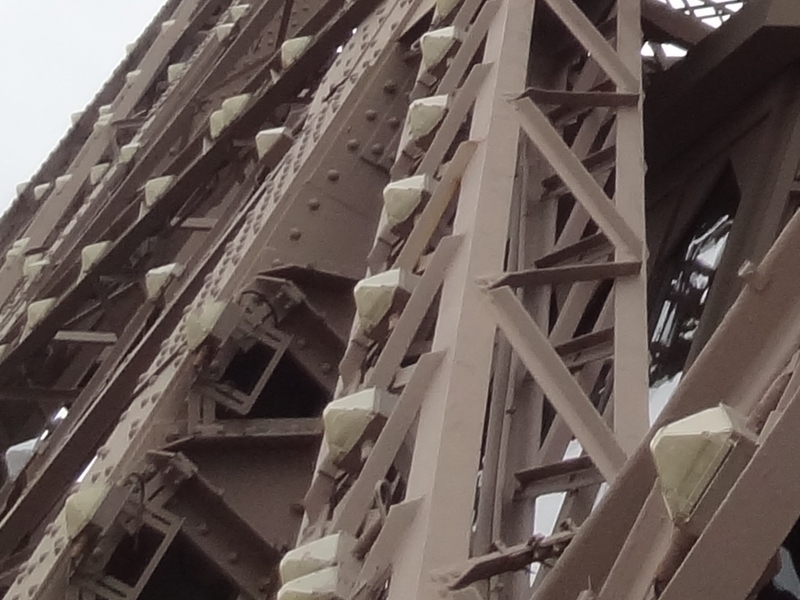 He too is enlightened. 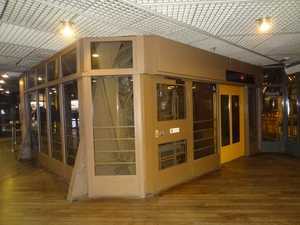 After going around the floor, I will take care of the 3 halls, the three main buildings. 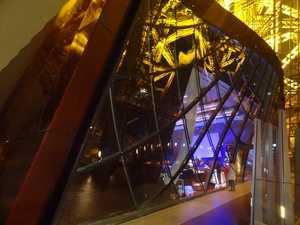 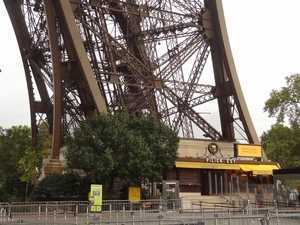 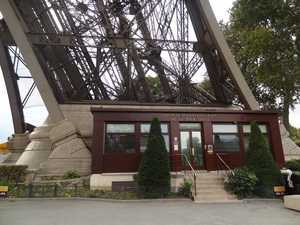 The lobby "Eiffel" is for rent, and today it has been rented. 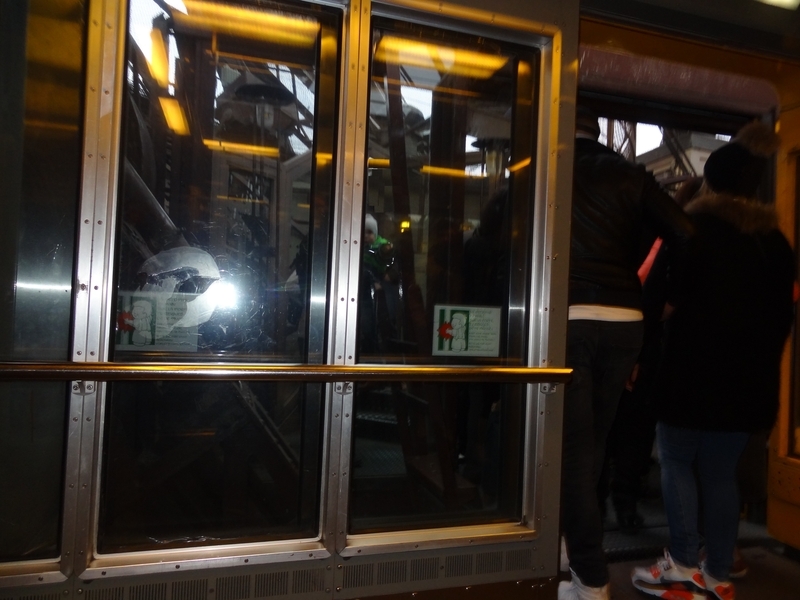 Entry forbidden so, but anyway I could not have entered it anyway. 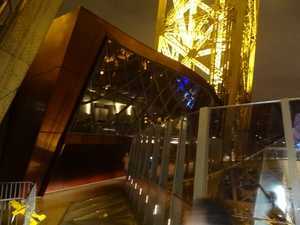 The other hall is the restaurant 58 °, so it is not especially visitable, unless you go there to eat, which is not my case. 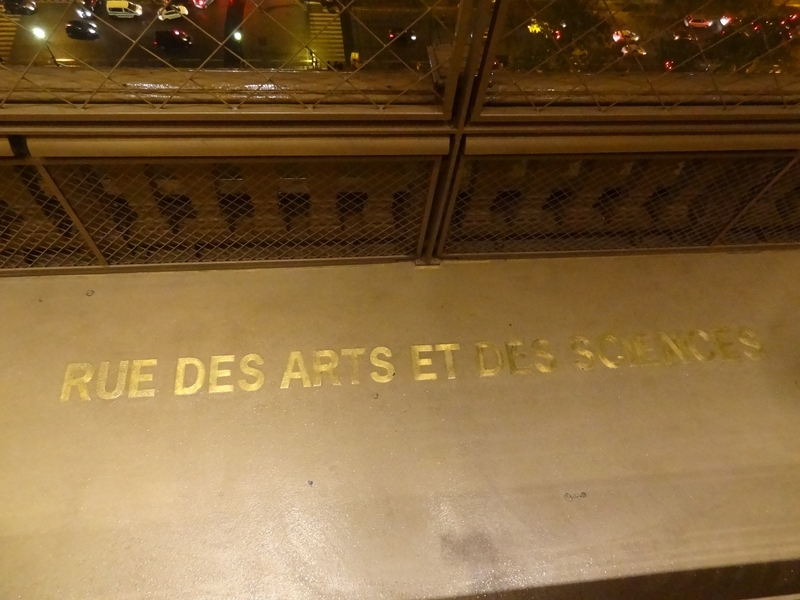 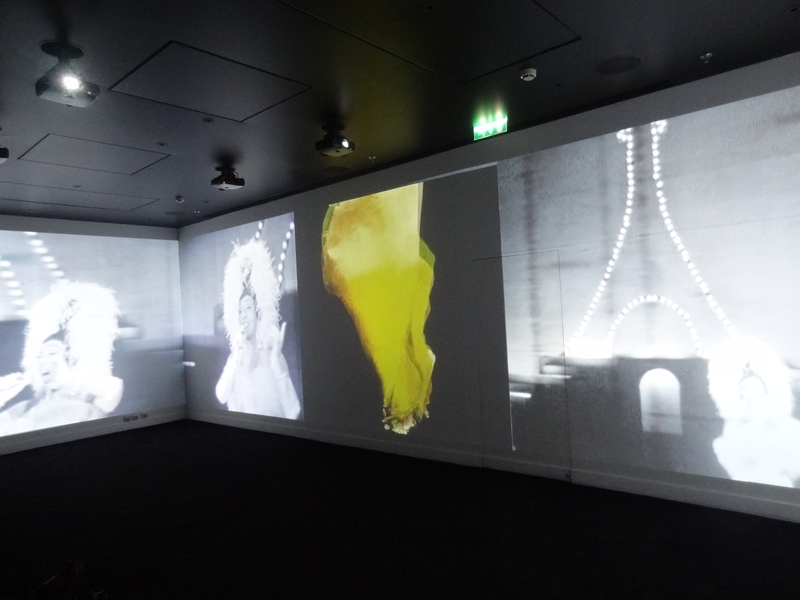 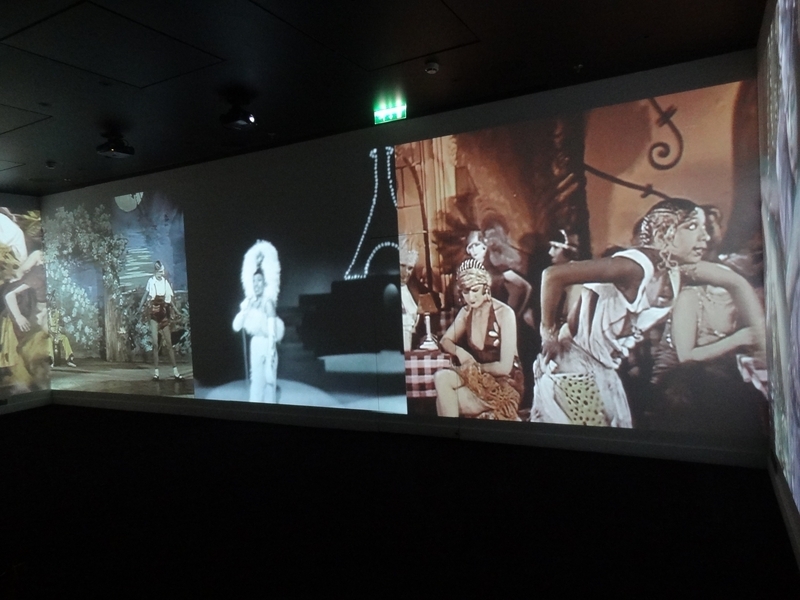 The last, the Ferrié hall, is open (and advised) to the public, so I go to him. 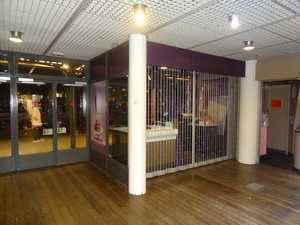 It contains a shop, a restaurant, a cinema, a relaxation area, toilets. 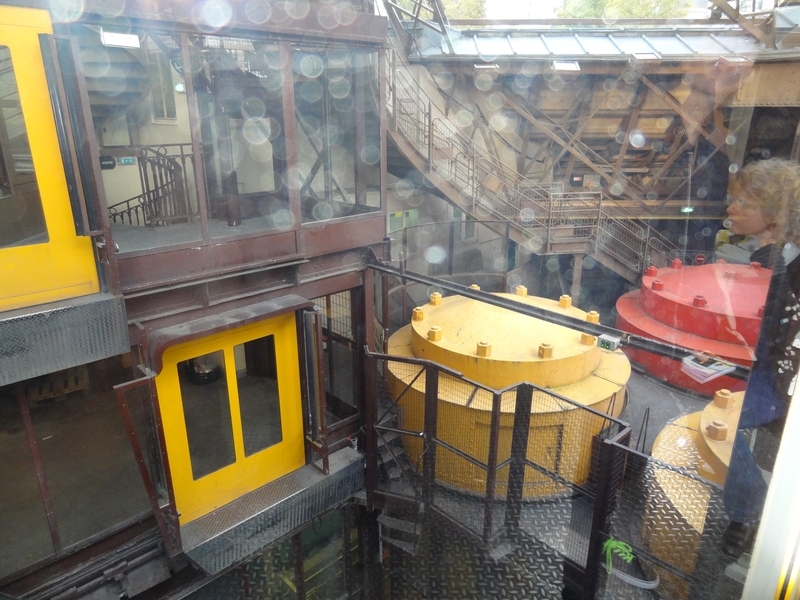 I also advise to go wash hands: We have a bird's eye view on 60m deep! 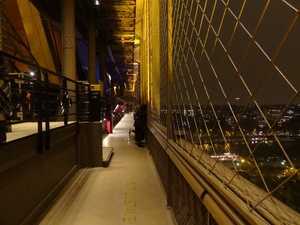 Well, it's getting late, it's going to be time to leave. I make a last lap of the floor, before deciding definitively. 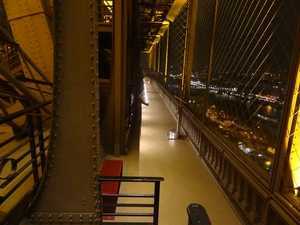 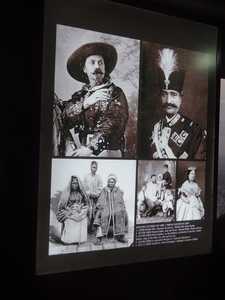 This time I will go down the elevator to see the inside of the West pillar, sometimes there are special things to see. 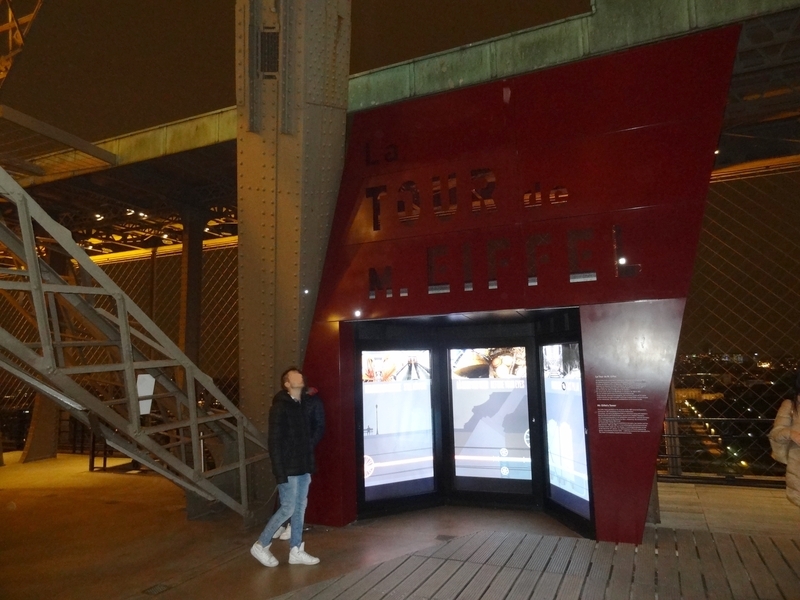 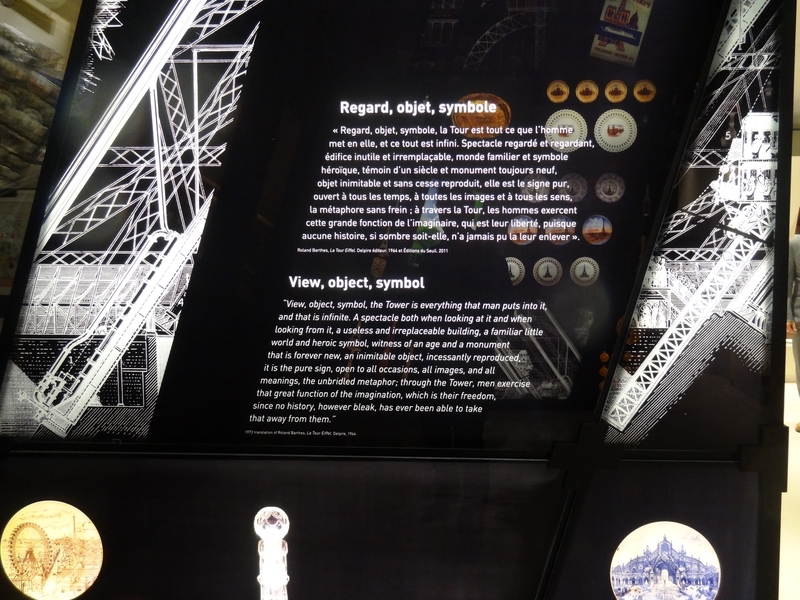 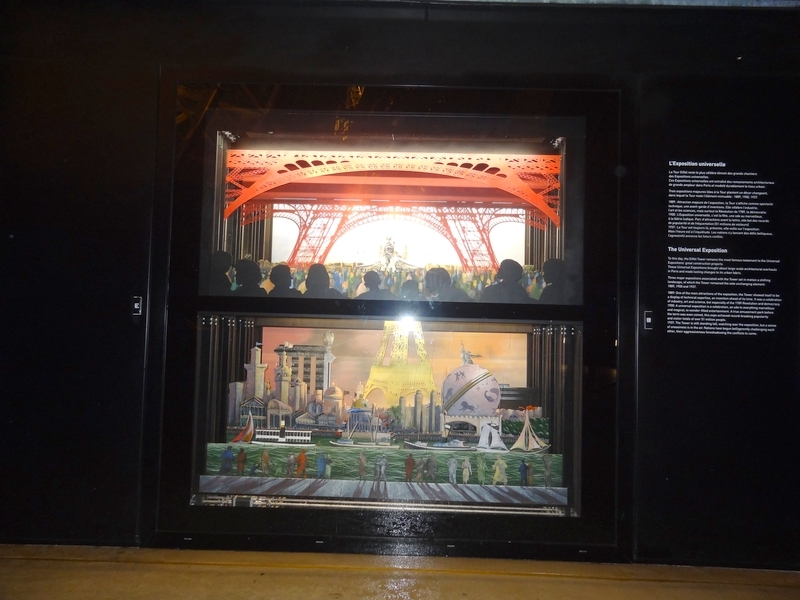 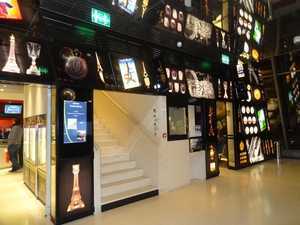 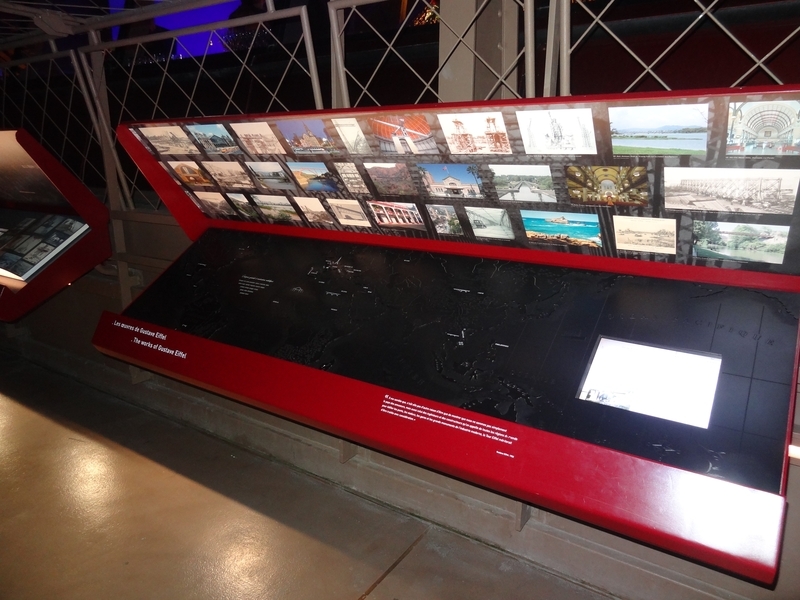 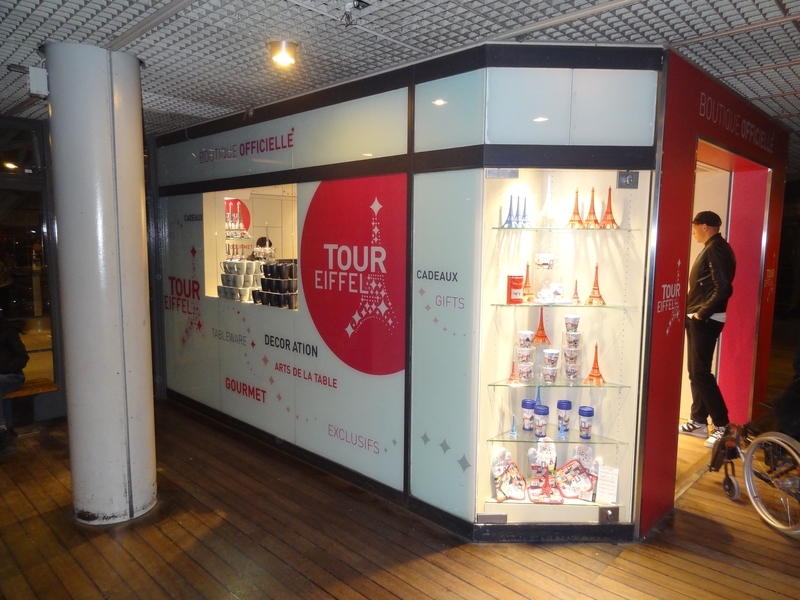 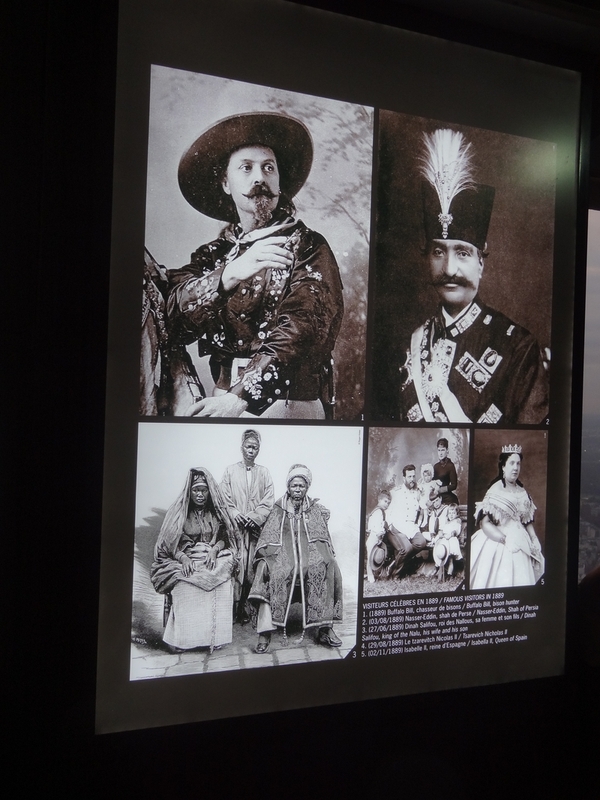 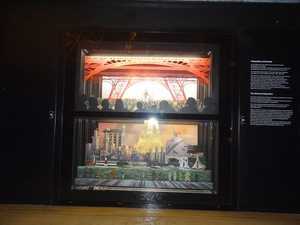 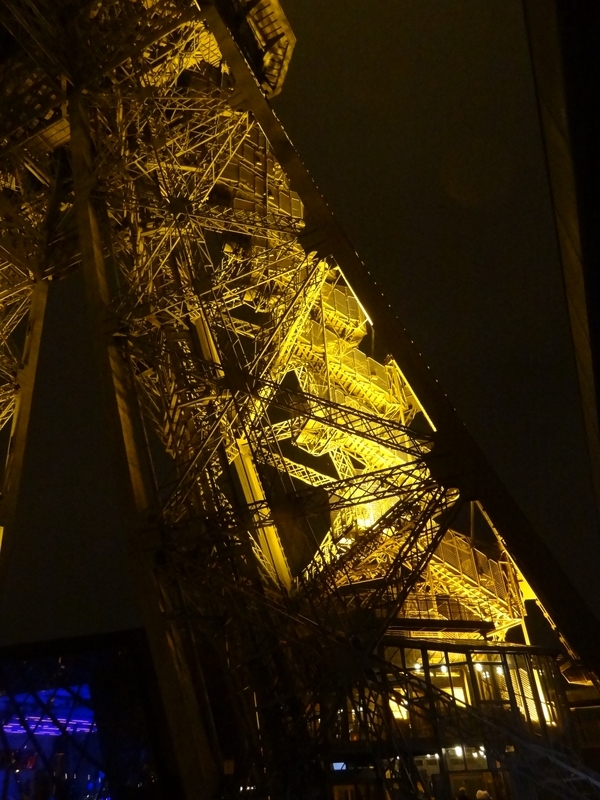 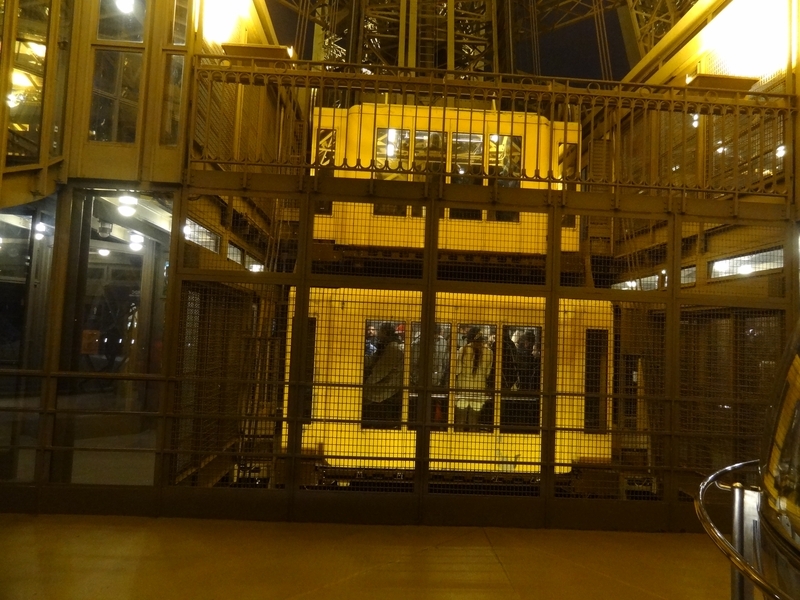 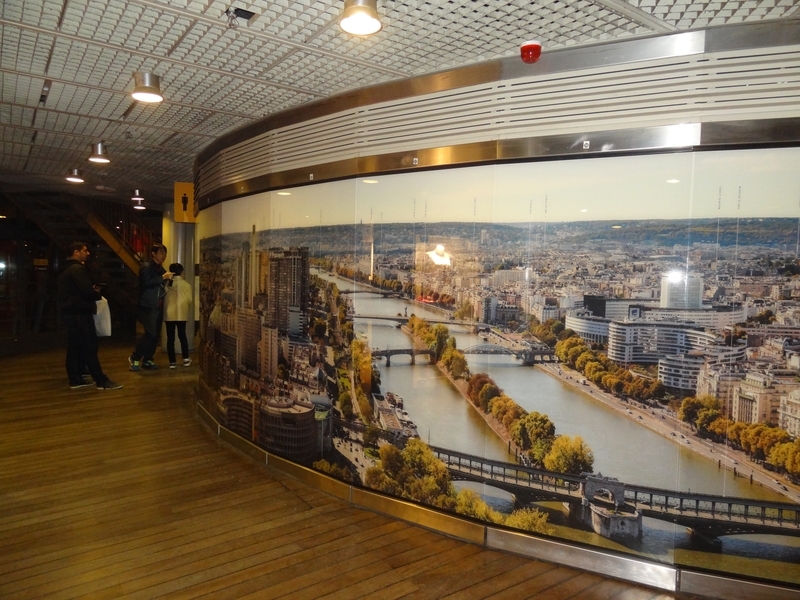 Well, I did not really walk on the outside galleries, it is true that there are interesting explanatory panels on the Eiffel Tower, how it was decided, built, in which films it appears, its comparison with the other world tours, etc. Exit the tower is the last pillar. 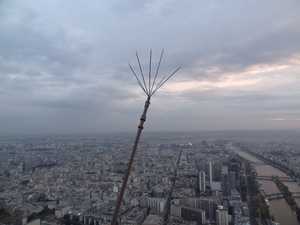 View of the crossbowman, perfectly maintained. 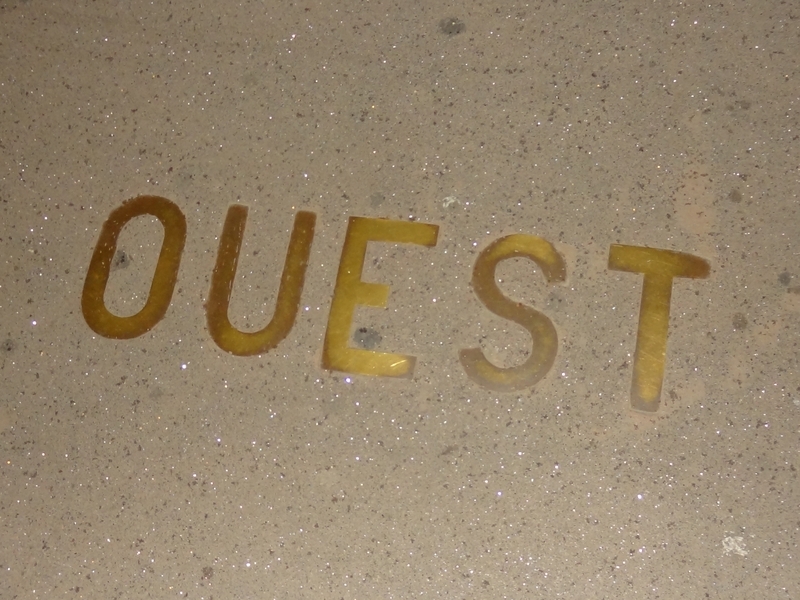 Well, this time for sure, I came back to the floor of the cows. It remains for me to leave by the same path, but this time I will take the night photos, and preferably glitter. Luck ! It's precisely 21h battery, the flicker will be triggered! 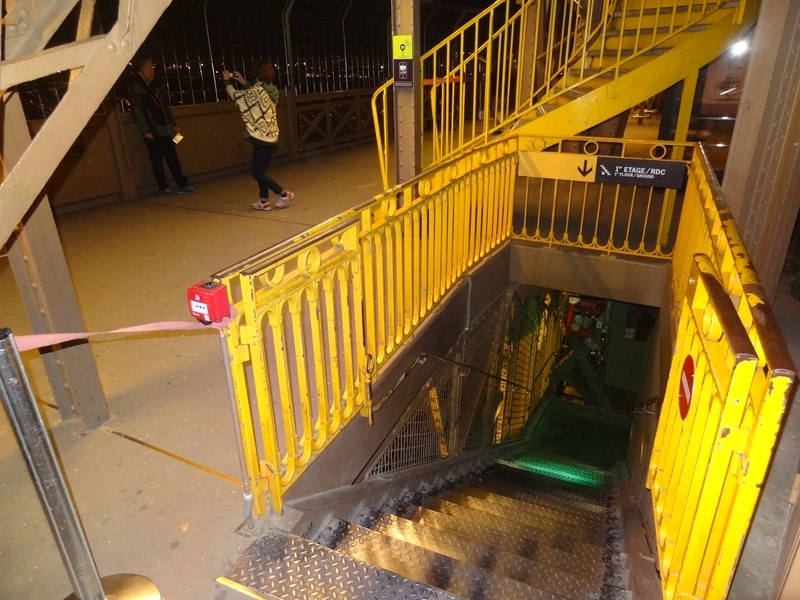 And now, I leave the subway full of images. 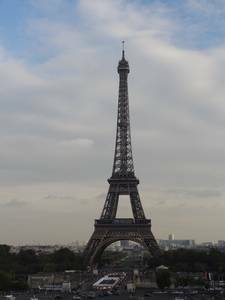 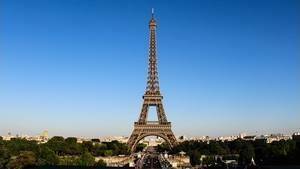 The Eiffel Tower is really spectacular, it probably took a lot of strength to conceive it, build it, and manage to keep it. If you enjoyed this story in photos, read the text story, it is much more complete.